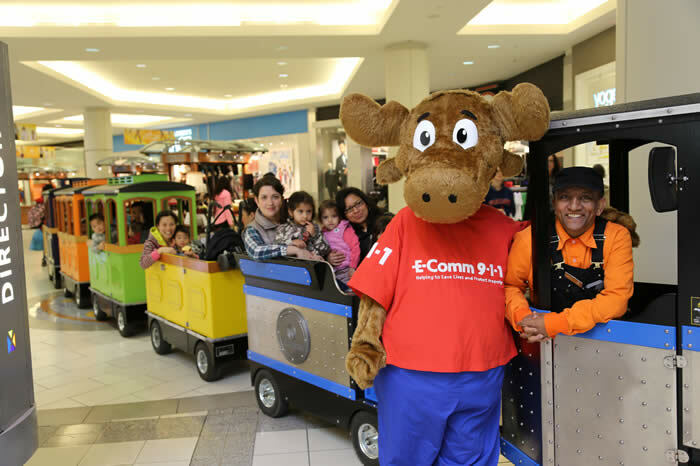 ALI and ANI are our 9-1-1 Moose Ambassadors and they love attending community events. ALI is a teacher and a mentor who hates pocket dials and loves 9-1-1 callers who listen carefully, speak clearly and answer call takers’ questions as best they can. 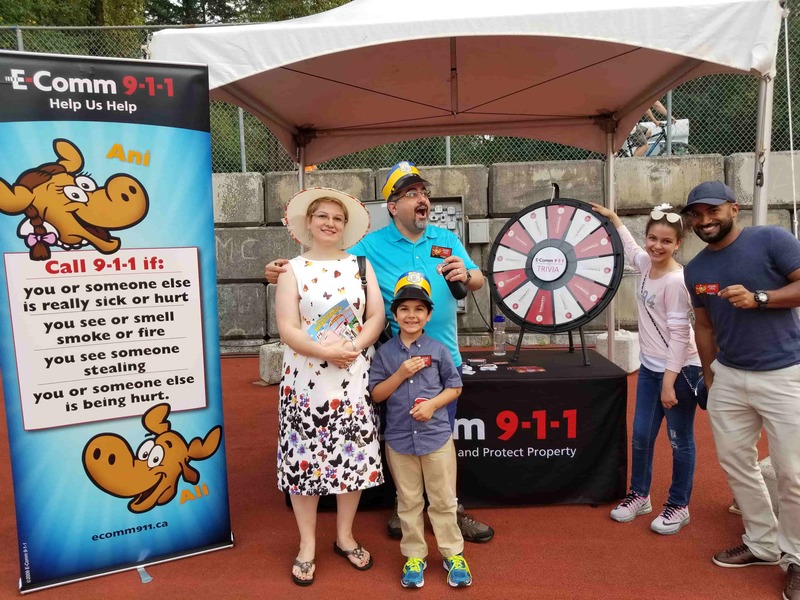 ANI loves teaching little and big kids about preventing pocket dials, emergency vs. non-emergency calls and knowing your location when you call 9-1-1. 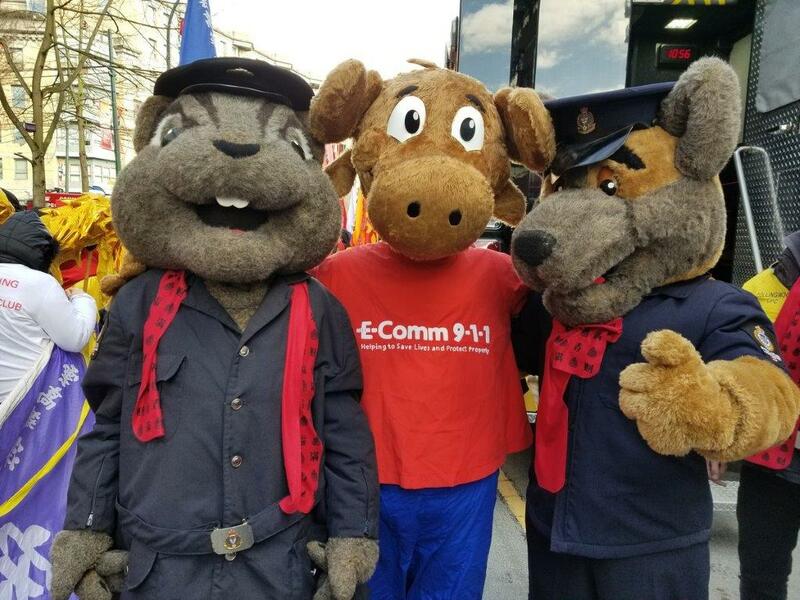 If you have an upcoming event in your community, contact 911education@ecomm911.ca to request to have ANI or ALI, our 9‑1‑1 Moose Ambassadors, attend along with their 9-1-1 education material. 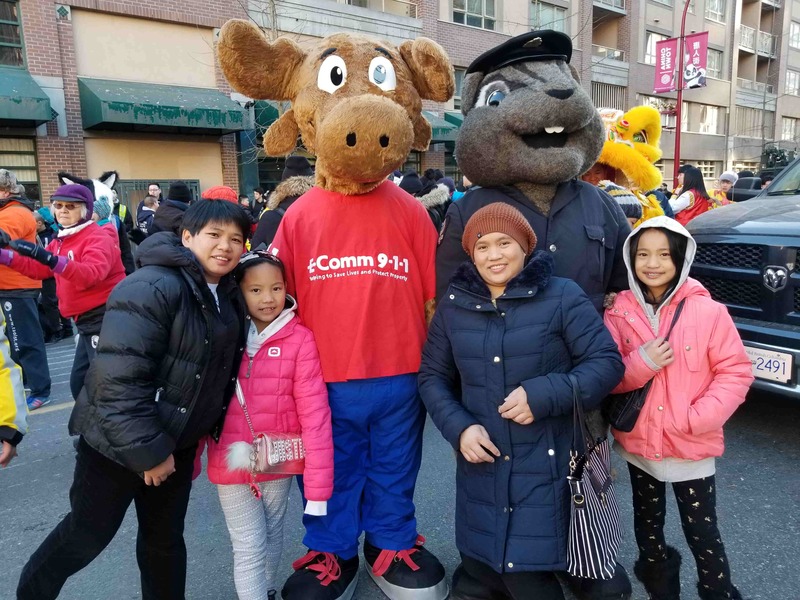 Our 9-1-1 Ambassador ALI was proud to march in the Chinese New Year Parade in Vancouver on Feb. 10, 2019. E-Comm was at the 45th Vancouver Chinatown Spring Festival Parade on Feb. 18, 2018. 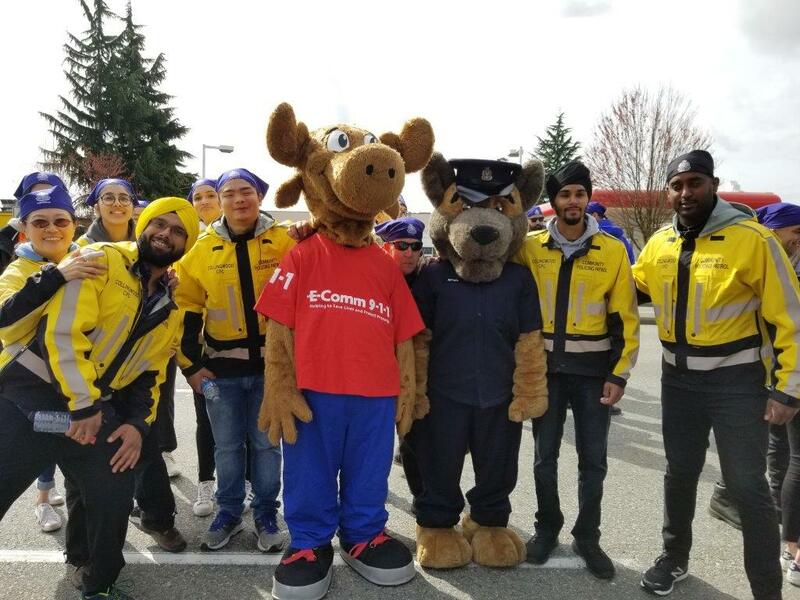 Our 9-1-1 ambassador ALI took part in the Vancouver Vaisakhi parade on April 14, 2018. E-Comm President and CEO Oliver Grüter-Andrew meets with memberas of the Fraser Valley Regional District in Whistler on May 10. 2018. 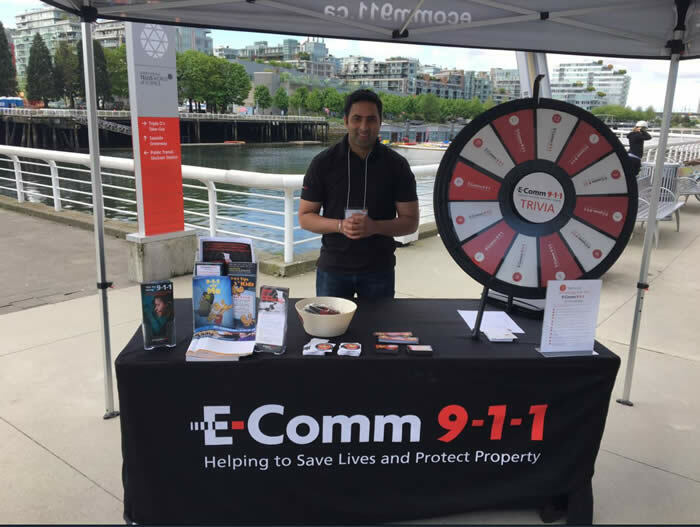 E-Comm representatives at the May 11, 2018 emergency preparedness event at Canada Place in Vancouver. Photo credit: Michael Beck, BCIT News. 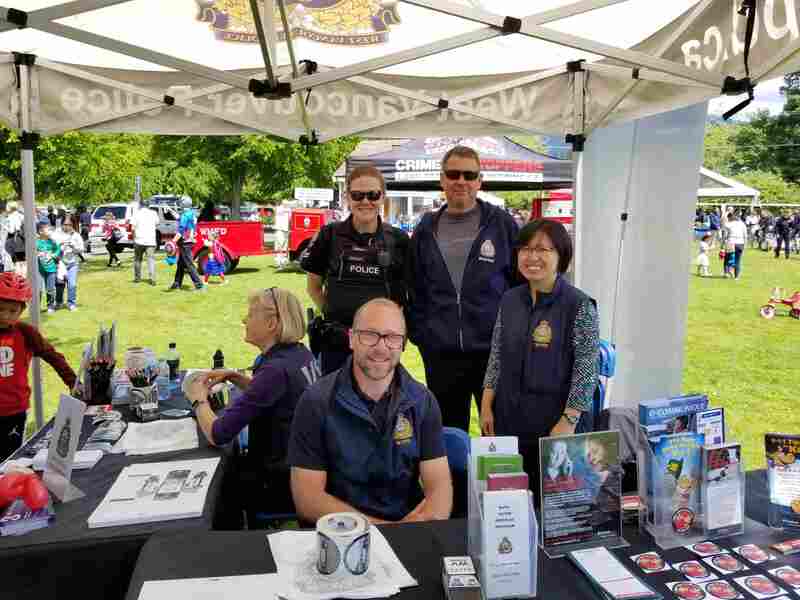 E-Comm had a great time at Collingwood Days in Vancouver with representatives from Collingwood Community Policing Centre and Crime Stoppers. 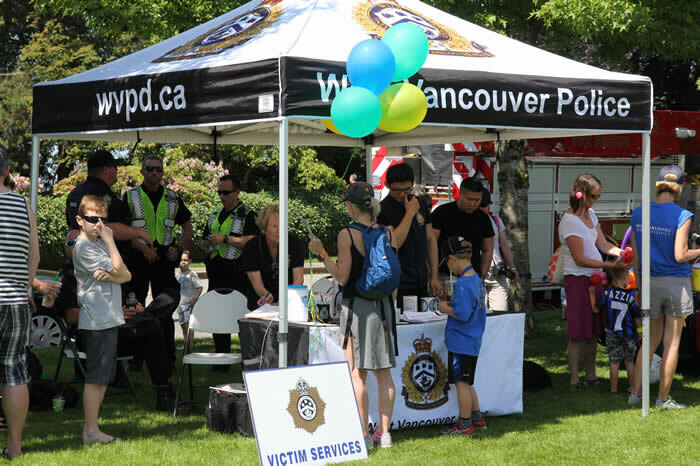 We joined West Vancouver Police and Victim Services volunteers to chat about a variety of public safety matters including calling 9-1-1 at the West Vancouver 2018 Community Day on June 2, 2018. 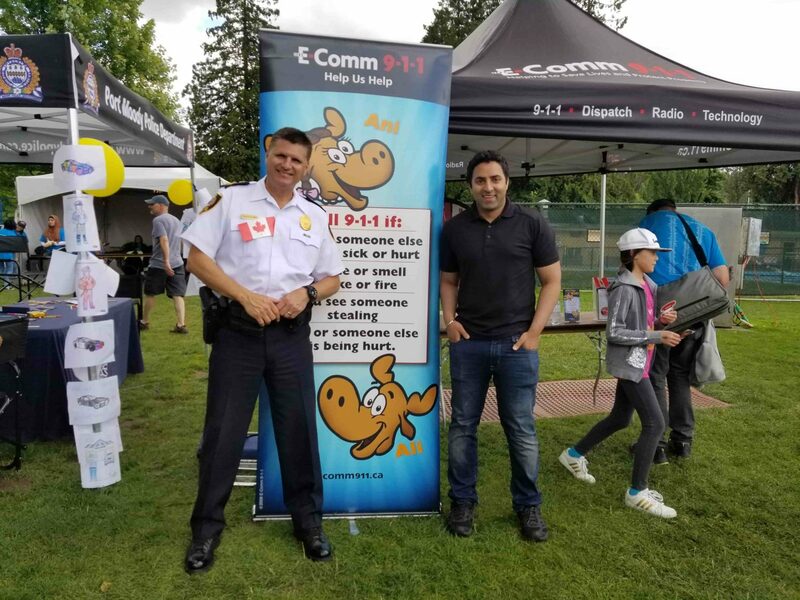 Port Moody Police Department Chief Constable David Fleugel stopped by our tent at Golden Spike Days in Port Moody on Canada Day, July 1, 2018. 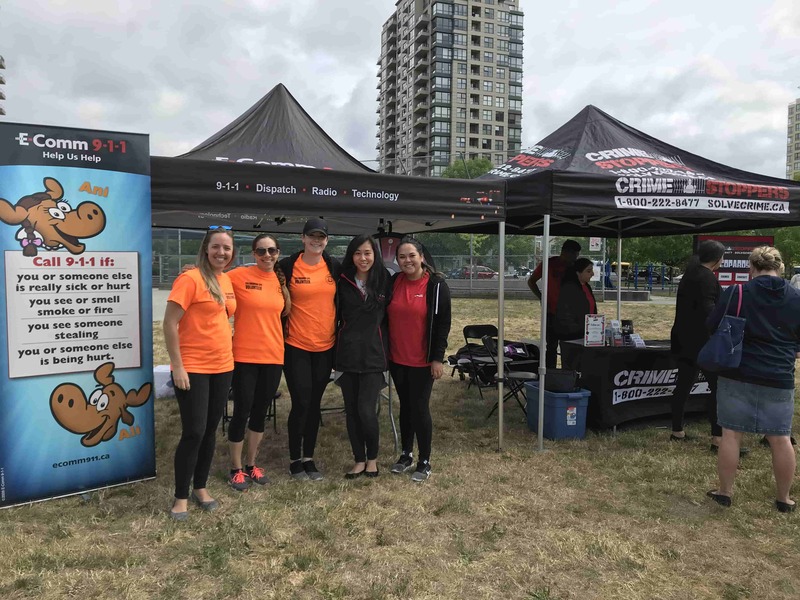 We joined Hastings Sunrise Community Policing Centre volunteers to chat with the community about 9-1-1 tips at the Sunrise Summer Kick-off in the East Village in Vancouver on July 7, 2018. 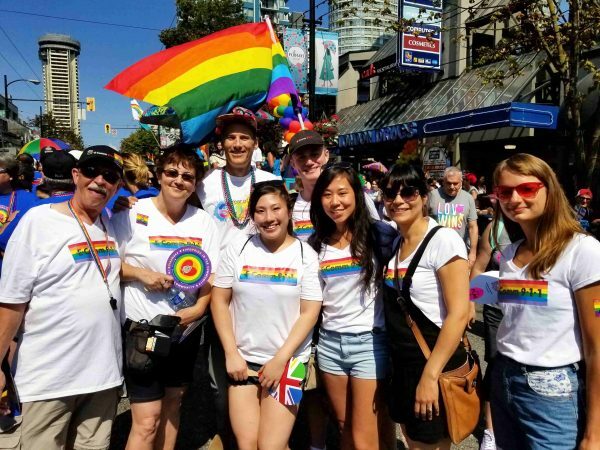 E-Comm staff were proud to be part of the Vancouver Pride Parade marching alongside City of Vancouver, Vancouver Police Department and our local community policing partners on August 5, 2018. 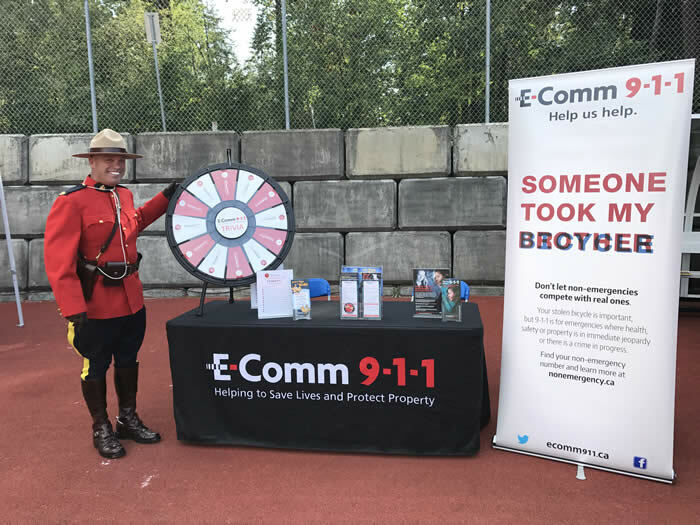 E-Comm had a great time with the community chatting about public safety and 9-1-1 tips at the Burnaby RCMP Musical Ride at Swangard Stadium on August 15, 2018. 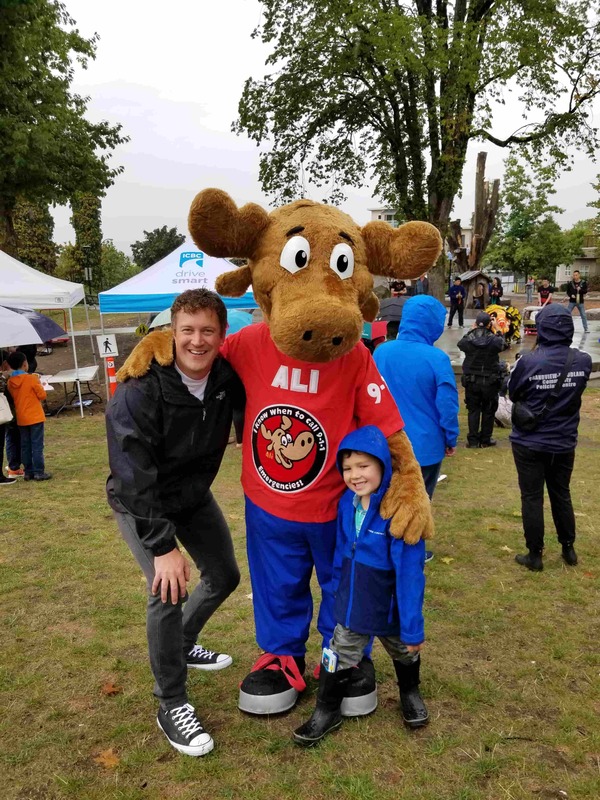 ALI, E-Comm's ambassador, had a blast connecting with the public and sharing our public education messages at the Cops, Kids and Commercial Drive community event in Vancouver on September 9, 2018. 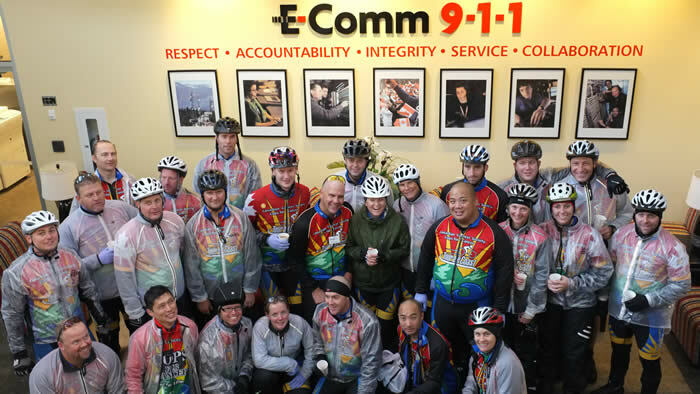 E-Comm had a great time fundraising money for Canadian Cancer Society and participating as guest riders in both Tour de Valley and Tour de Coast. 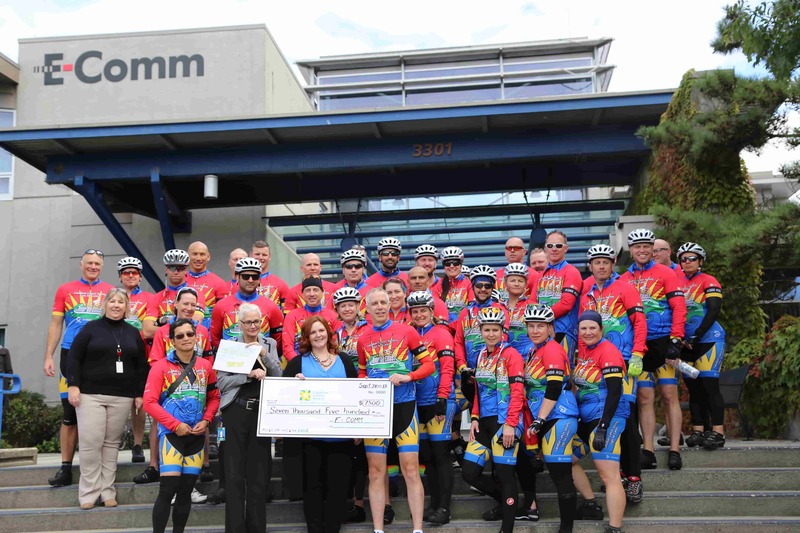 On September 24, 2018 the Tour de Coast visited E-Comm, where staff presented the Canadian Cancer Society with a $7,500 donation. 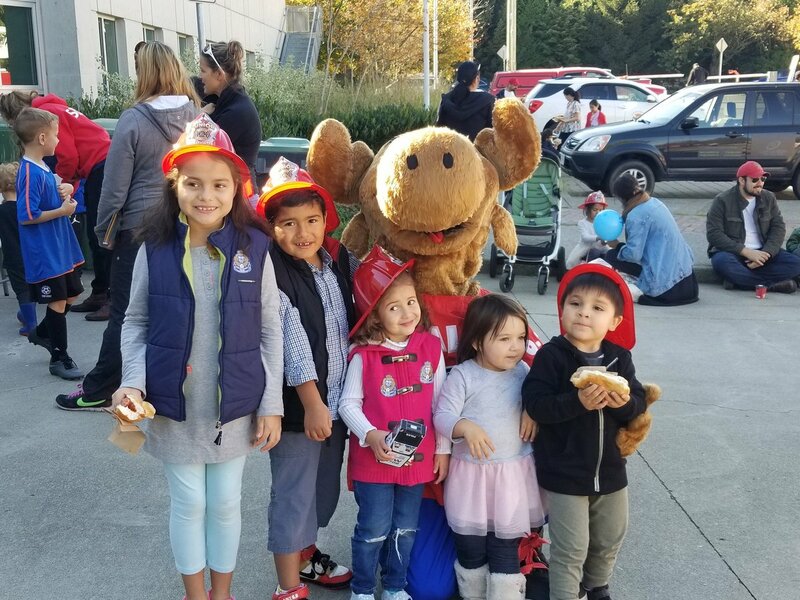 Our 9-1-1 Ambassador ALI was a big hit with the kids at the New Westminster Fire and Rescue Services Open House in New Westminster on October 13, 2018. 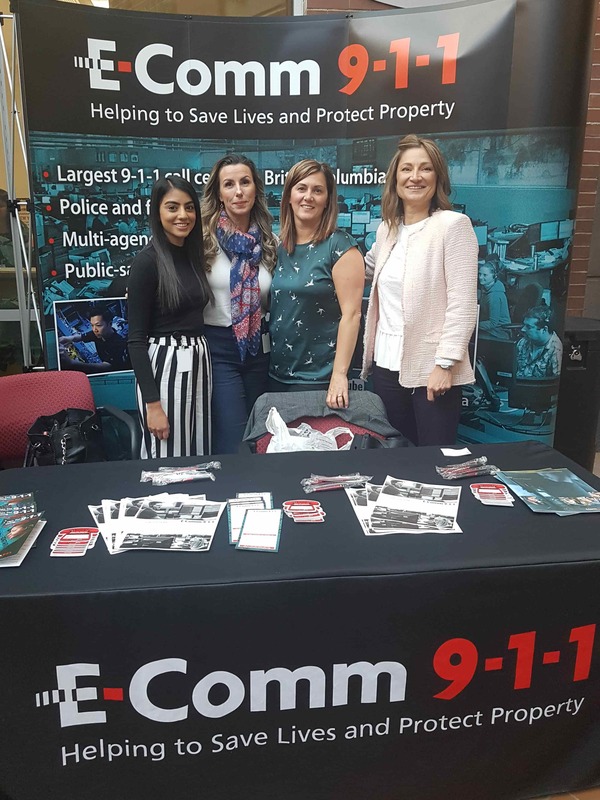 We joined Justice Institute of British Columbia (JIBC)'s Career/Recruiting Fair to chat with Law Enforcement Studies students about current job opportunities on October 15, 2018. 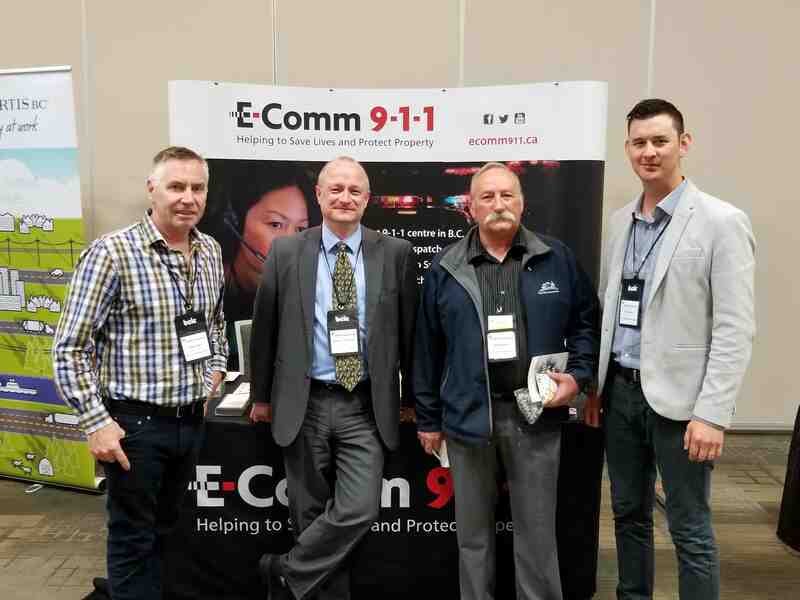 E-Comm attended the 2018 Emergency Preparedness and Business Continuity Conference in Vancouver Oct. 29-30, 2018. Practitioners from the areas of emergency management, health, first response, emergency social services and volunteerism, business continuity and academic/technical took part. 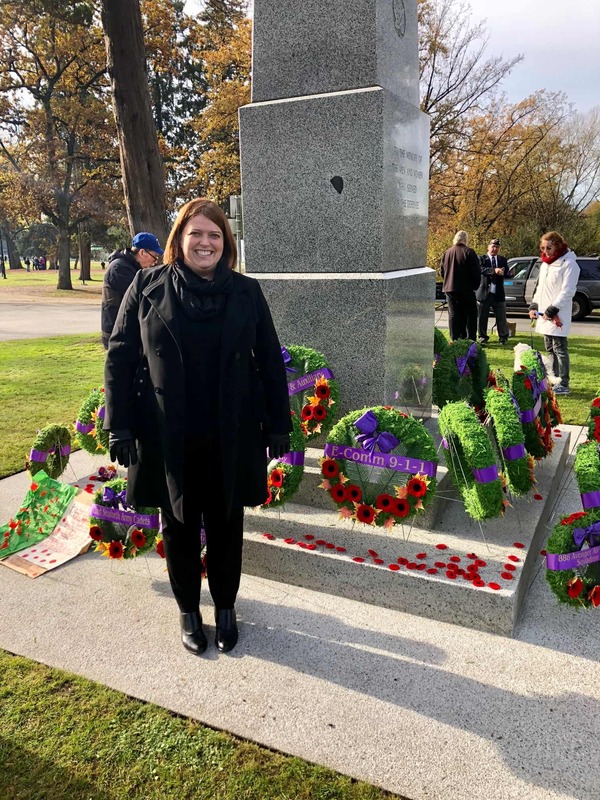 E-Comm attended the Victory Square Remembrance Day Ceremony, on November 11, 2018, to honour all those who have served and sacrificed for our country and freedom. 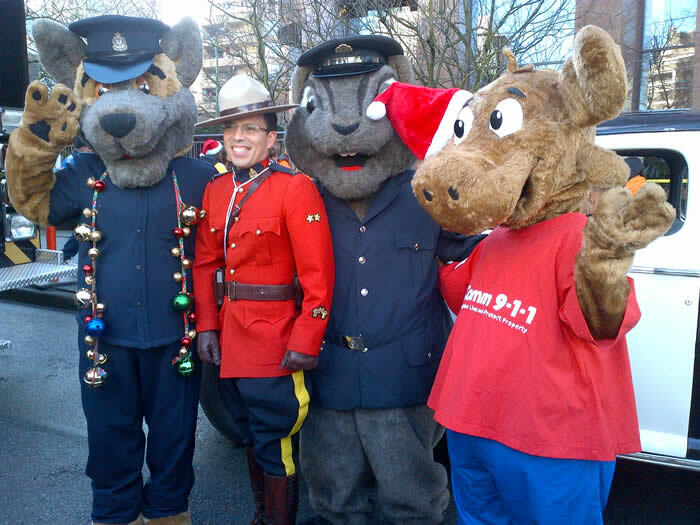 Our 9-1-1 Ambassador ALI was proud to march alongside our Vancouver police partners at the Santa Clause Parade on December 2, 2018. 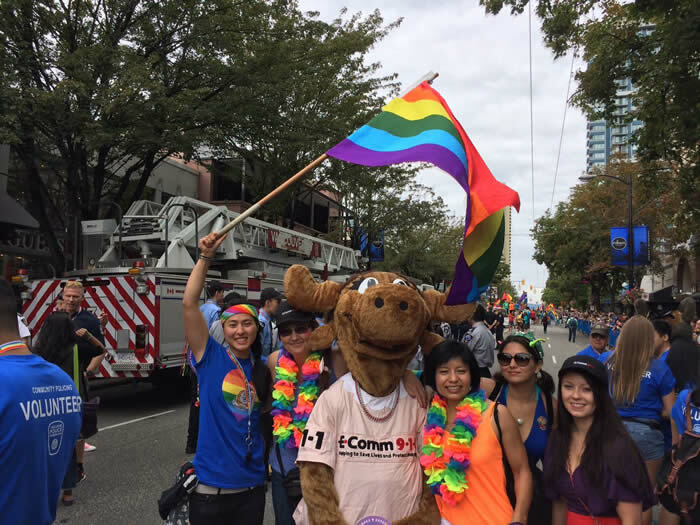 E-Comm staff were proud to march in the Vancouver Pride Parade on August 6. 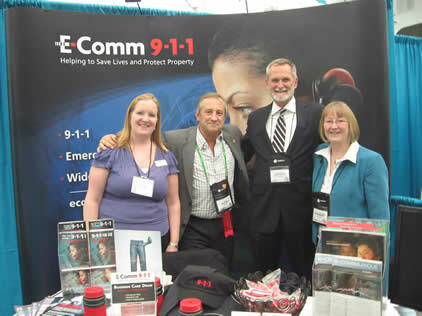 From April 10-12 E-Comm attended the Canadian Association of Chiefs of Police Conference in Vancouver. 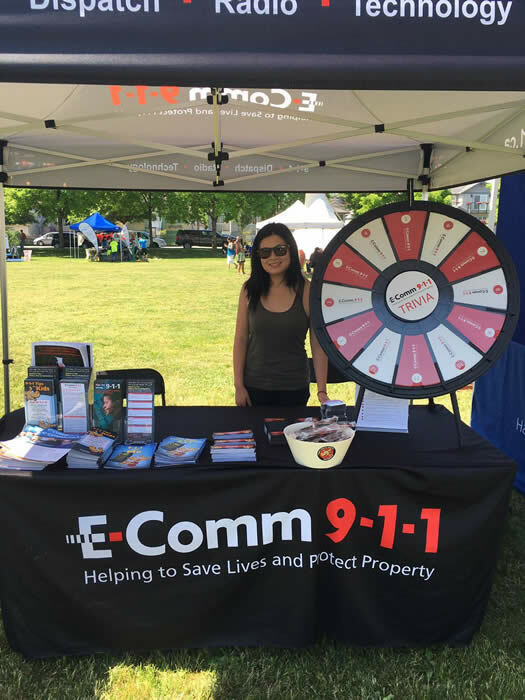 On May 27 E-Comm attended the 2017 Collingwood Days Festival. 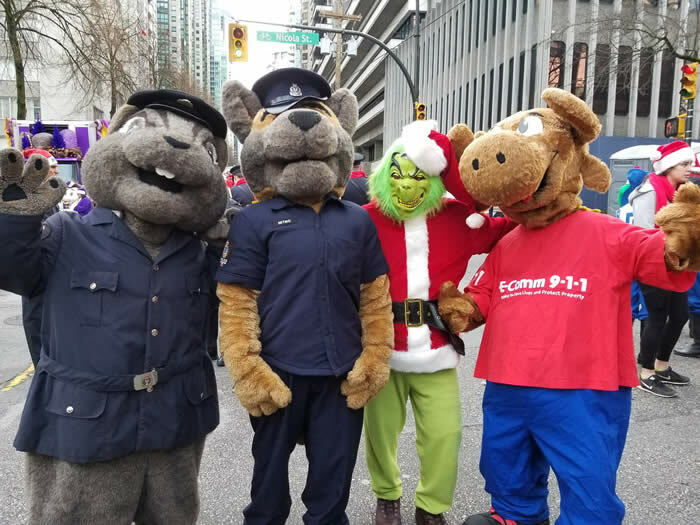 Our 9-1-1 mascot ALI joined our Vancouver Police Department partners to celebrate the 2017 Santa Claus Parade on December 3. 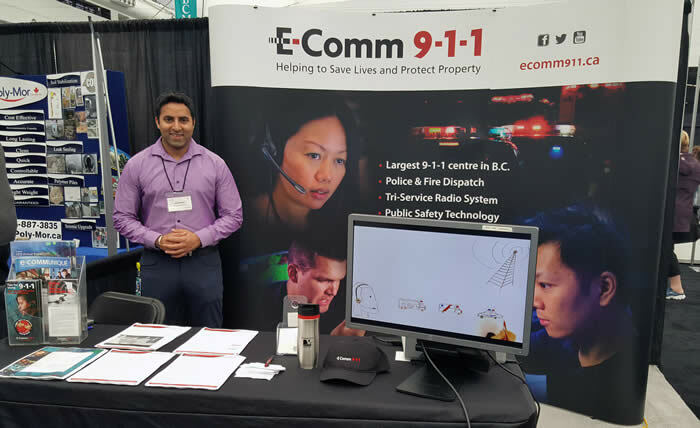 E-Comm was proud to be at the PNE to celebrate First Responders' Weekend and share public safety information with the public on August 19. 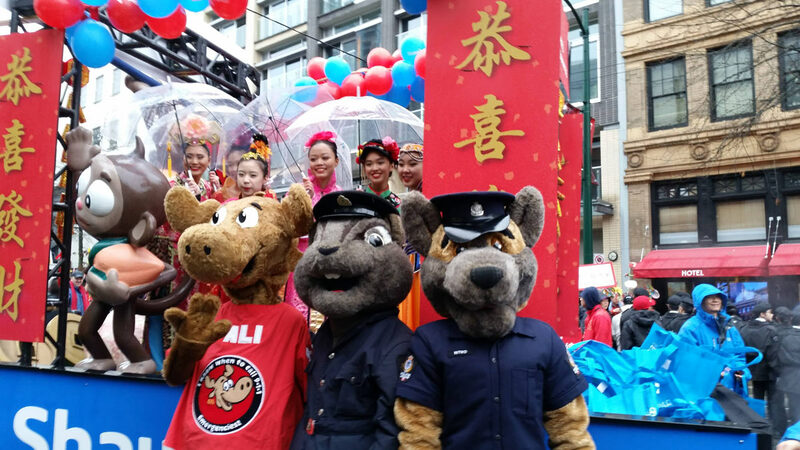 On January 29 ALI marched alongside Vancouver Police Department mascots in the 2017 Chinese New Year Parade. 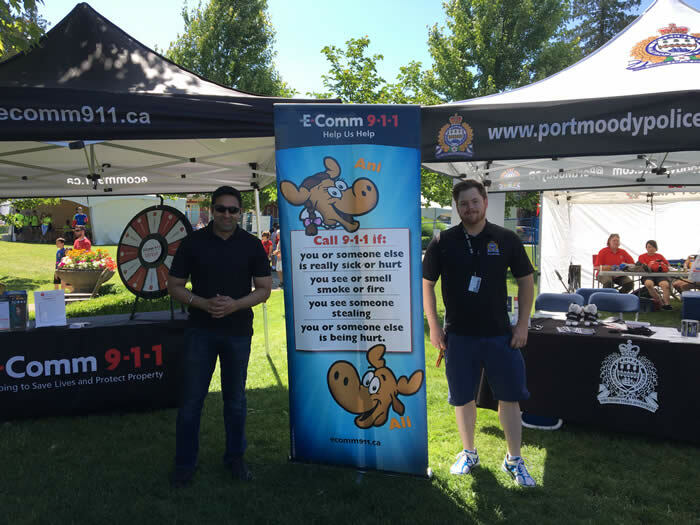 On July 1 E-Comm attended Golden Spike Days. 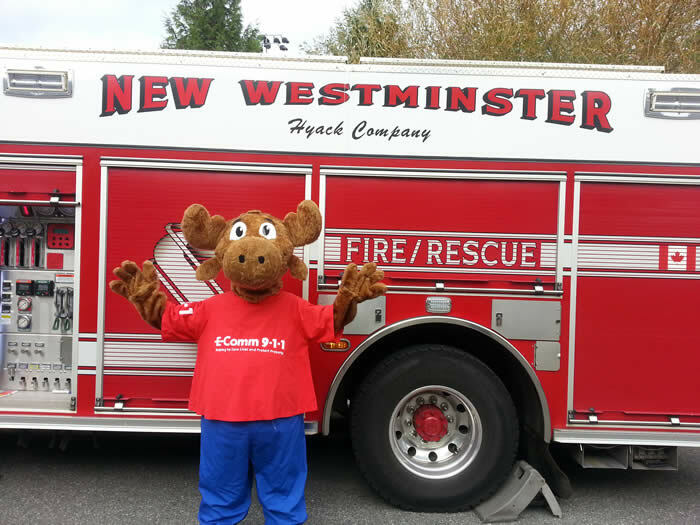 E-Comm and our 9-1-1 mascot ALI had a great time at the New Westminster Fire & Rescue Services Open House on October 15. 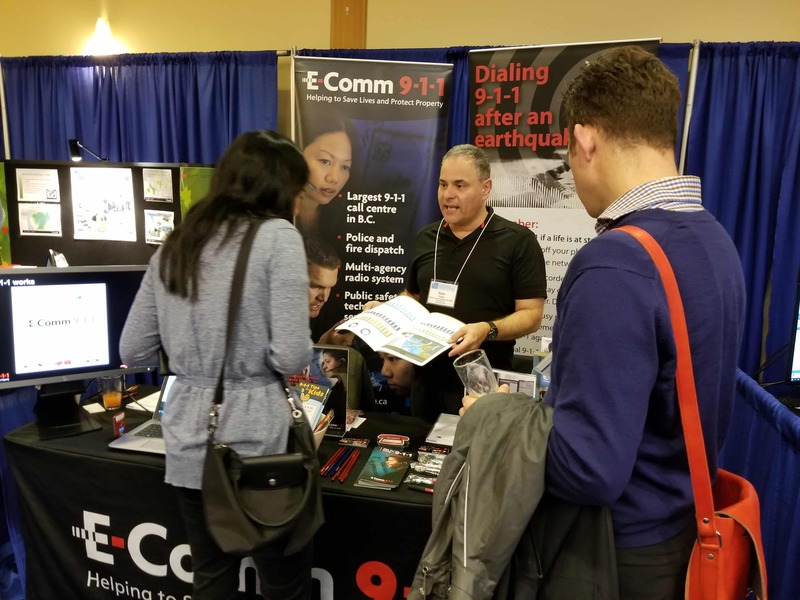 E-Comm was happy to be at the 2017 Union of BC Municipalities Convention & Tradeshow to talk about 9-1-1 with members of local government from September 27-28. 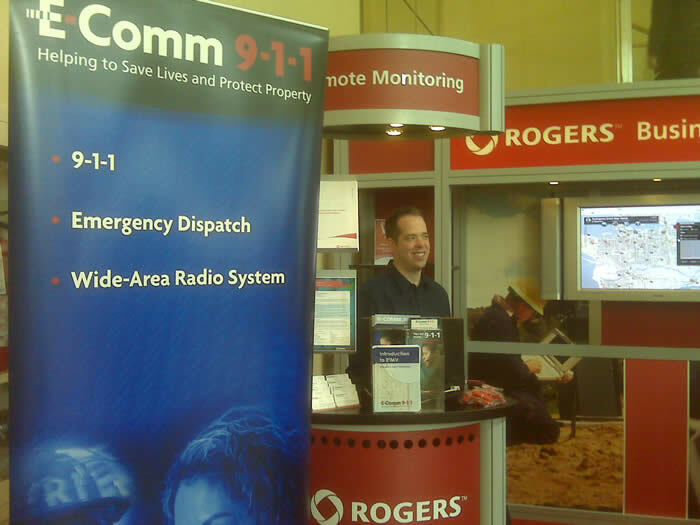 On May 10-12 E-Comm attended the LMLGA conference to provide public safety information to delegates. 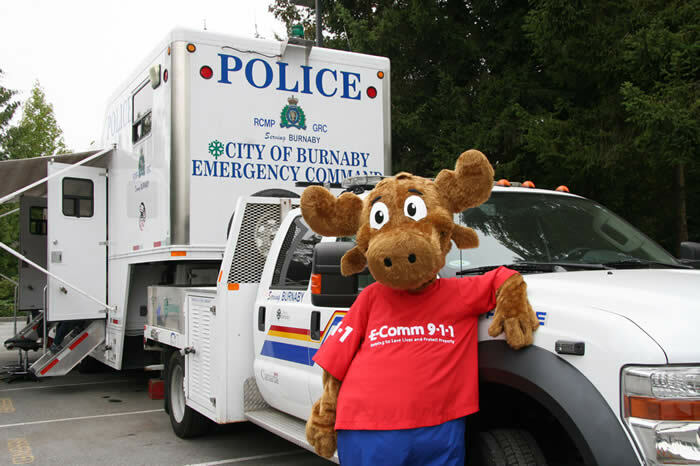 E-Comm provided public safety information to spectators at the RCMP Musical Ride in Burnaby on August 18. 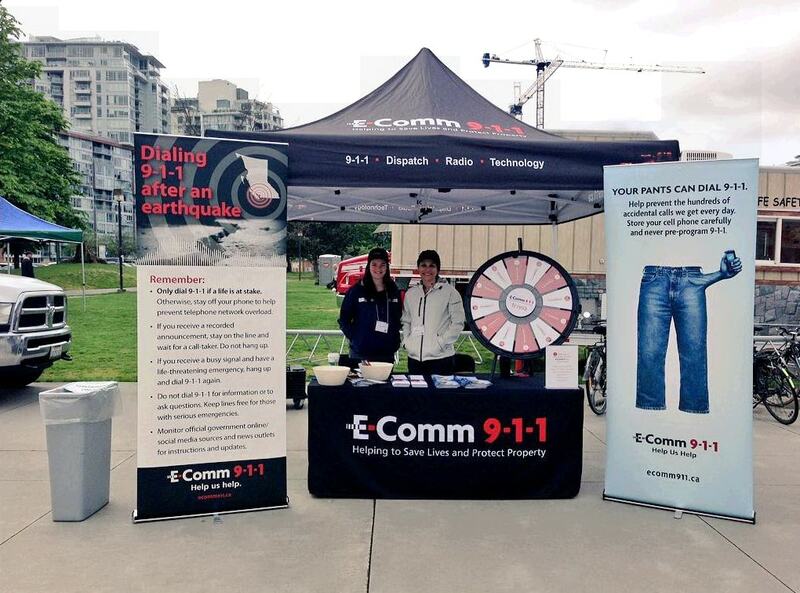 On May 7 E-Comm was part of the City of Vancouver’s Emergency Preparedness Week at Science World. 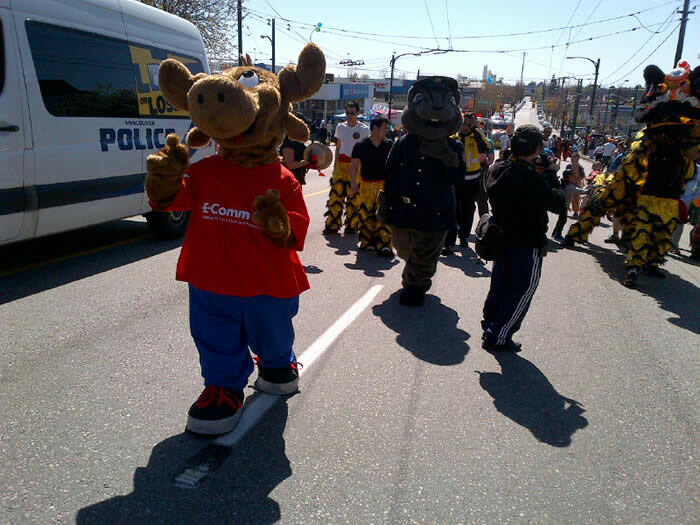 E-Comm celebrated with VPD partners at the Vancouver Vaisakhi Parade on April 22. 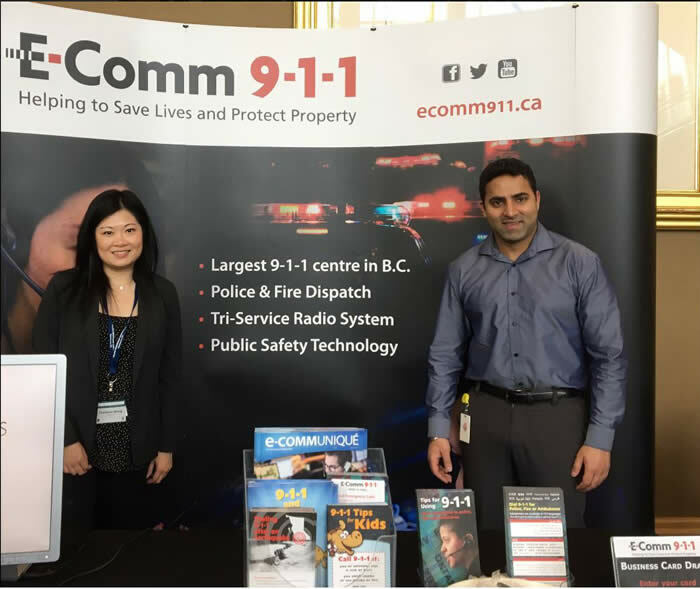 On March 17 E-Comm took part in the Burnaby RCMP Senior Fraud Awareness Forum to share information about public safety with the public. 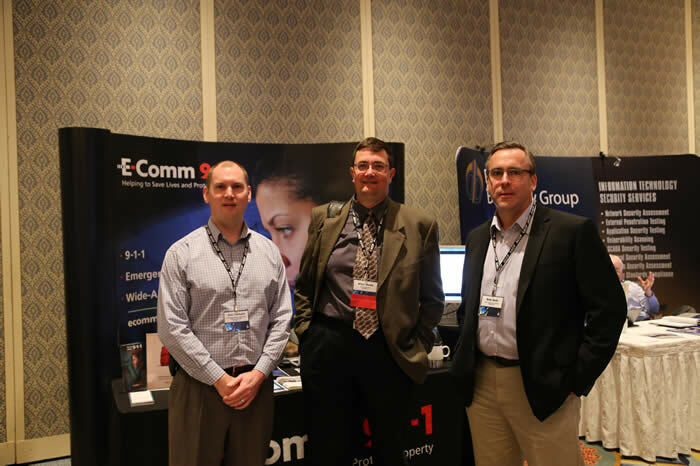 On February 22 & 23 E-Comm attended the CACP Information & Technology Workshop to provide public safety information to delegates. 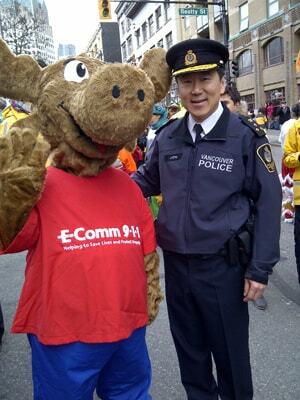 E-Comm celebrated at the Vancouver Chinese New Year Parade on February 14. 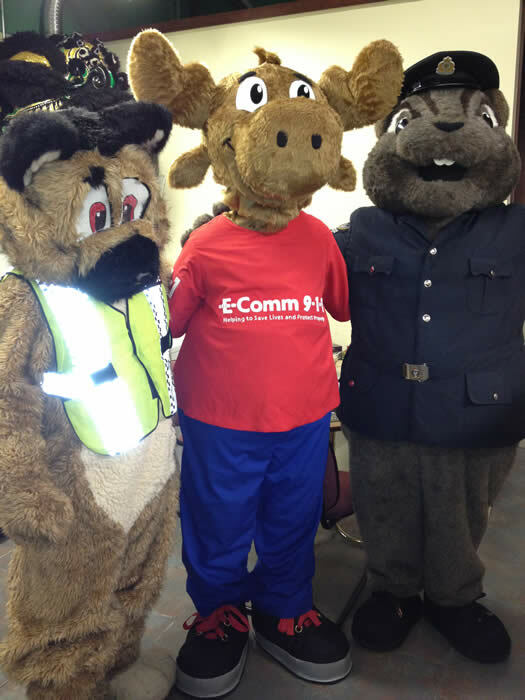 E-Comm joined community police partners on May 28 at Collingwood Days. 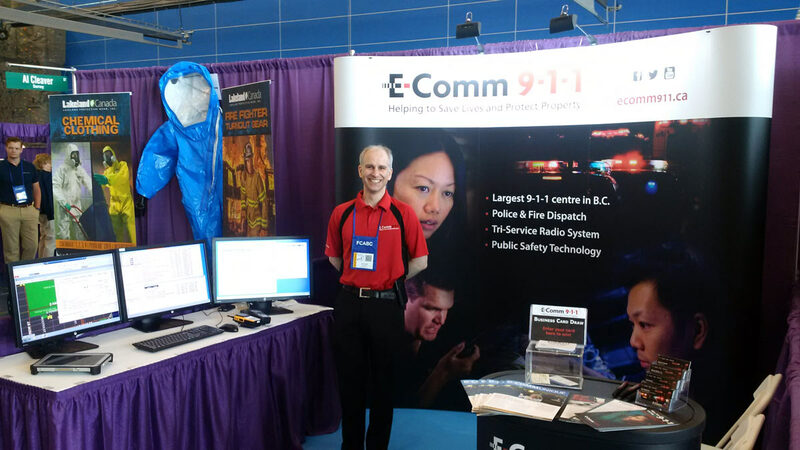 On April 29 & 30 E-Comm was part of Emergency Preparedness Week at Science World. 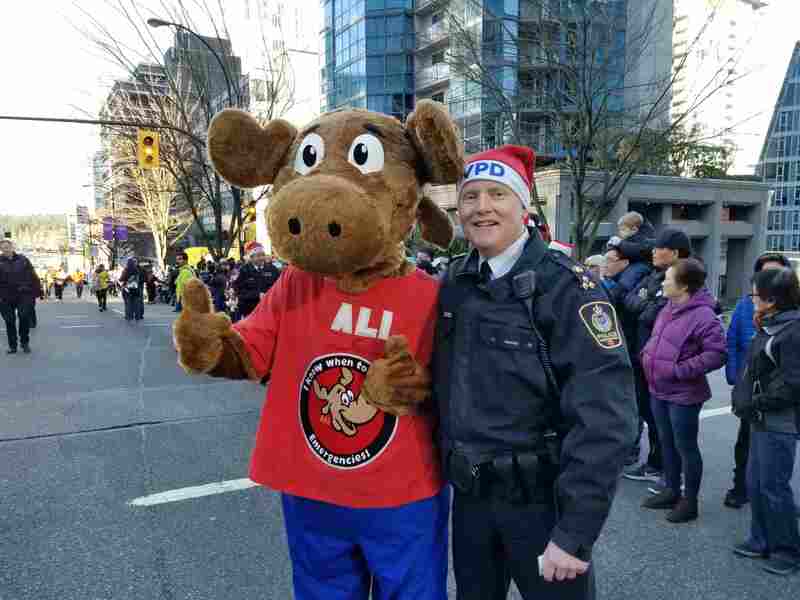 On December 4 ALI marched alongside Vancouver Police Department mascots in the 2016 Rogers Santa Claus Parade. 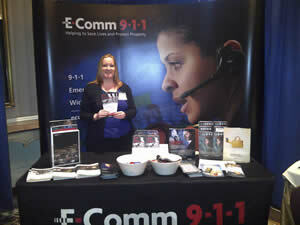 May 11-13 E-Comm attended the LMLGA conference to provide public safety information to delegates. 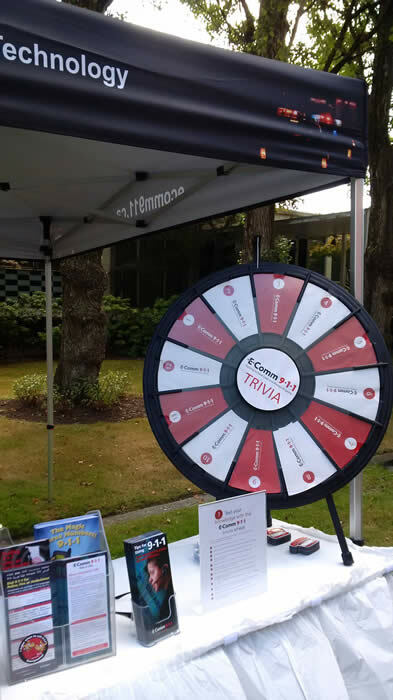 On July 9 E-Comm joined partners at the Hastings Sunrise Summer Kickoff. 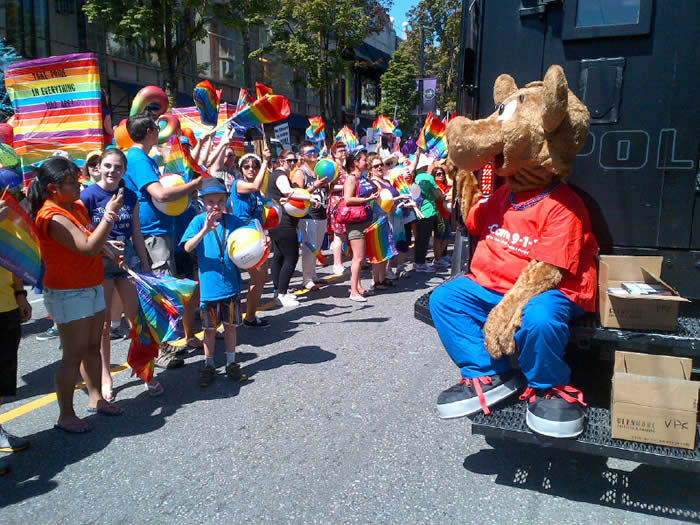 E-Comm staff were proud to march alongside VPD partners at the 2016 Vancouver Pride Parade on July 31. 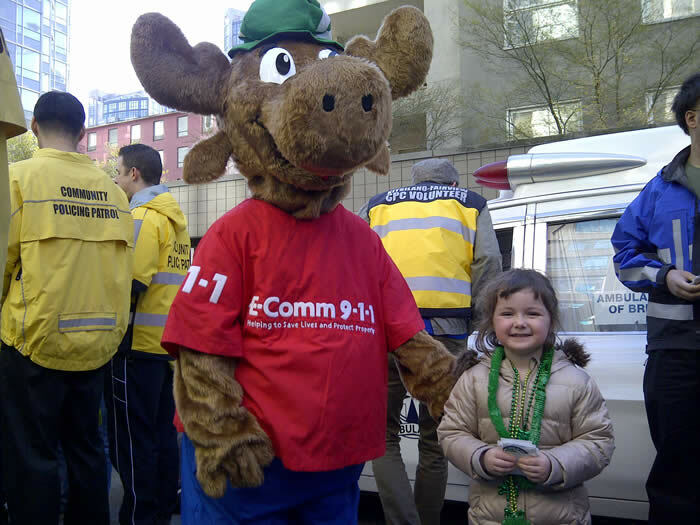 E-Comm walked alongside the Vancouver Police Department in the annual St. Patrick's Day Parade on March 13. 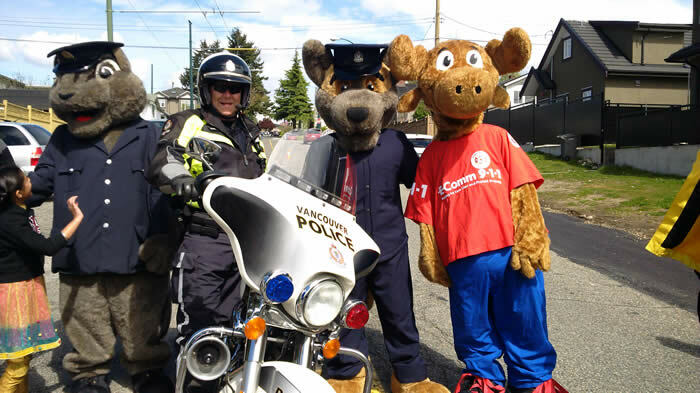 E-Comm celebrated with VPD partners at the Vancouver Vaisakhi Parade on April 16. 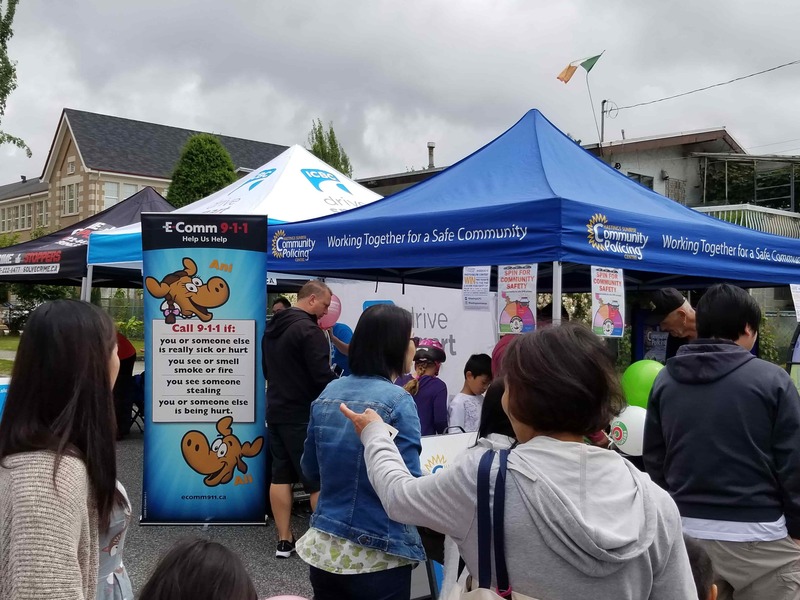 On June 4 E-Comm was in West Vancouver in celebration of Community Day. On June 5 & 6 E-Comm attended the B.C. Fire Expo. 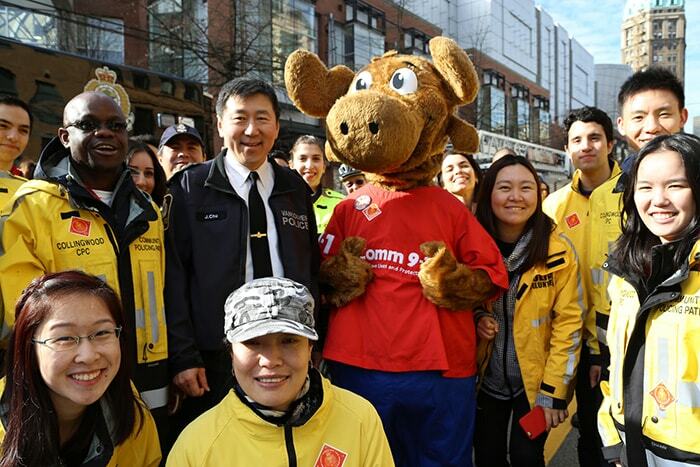 On February 22 E-Comm marched alongside our Vancouver Police partners in the annual Vancouver Chinese New Year parade. 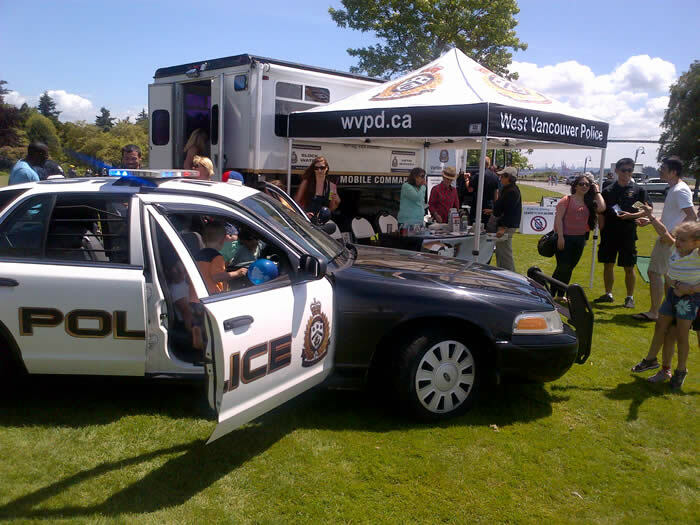 On June 6, E-Comm joined our partners in West Vancouver for the annual West Vancouver Community Day. 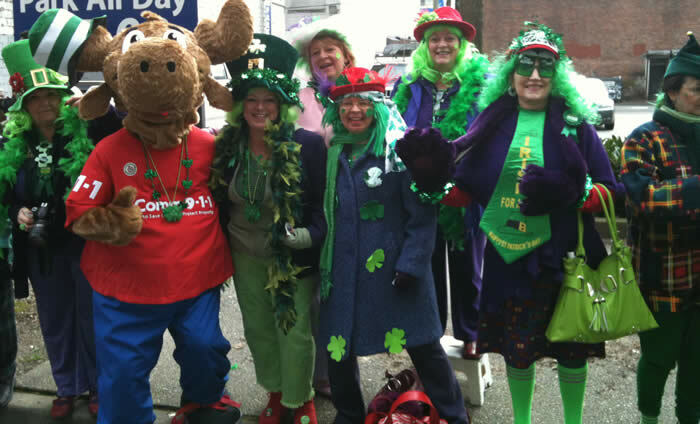 E-Comm attended the St. Patrick's Day parade in downtown Vancouver on March 15. 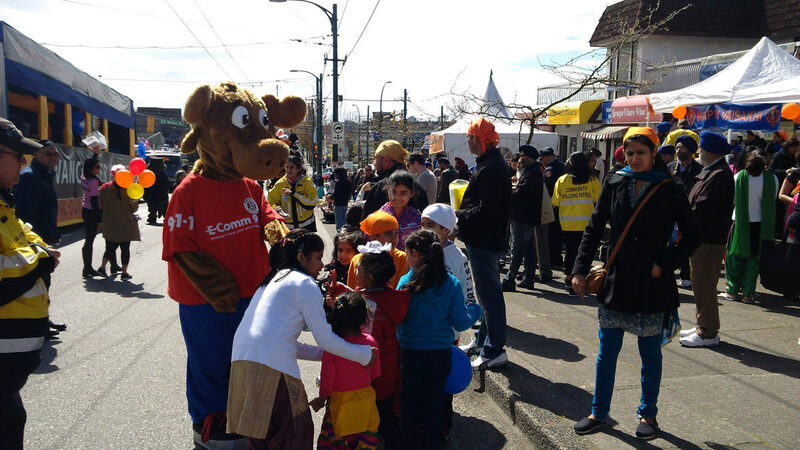 E-Comm celebrated at the Vancouver Vaisakhi Parade on April 11. 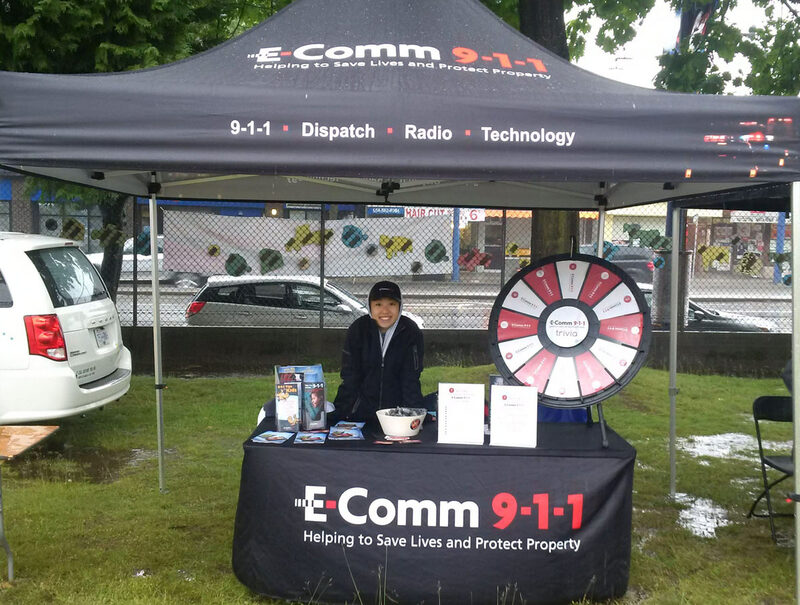 E-Comm attended the Collingwood Days festival in Vancouver on May 30. 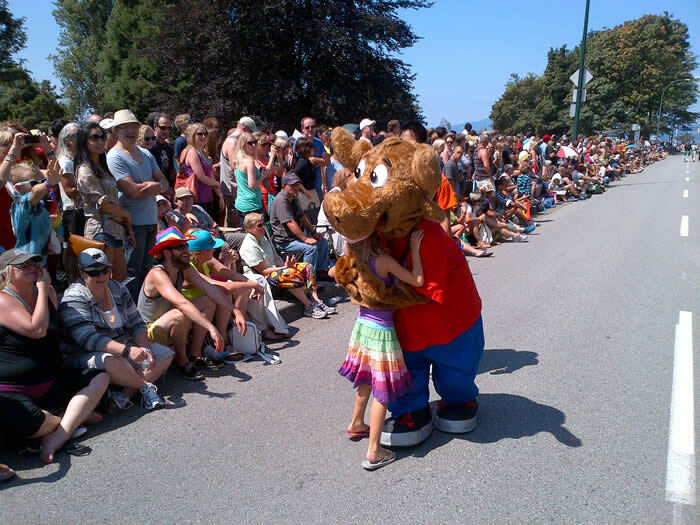 On August 2 E-Comm walked alongside the Vancouver Police Department in the 37th Annual Pride Parade. 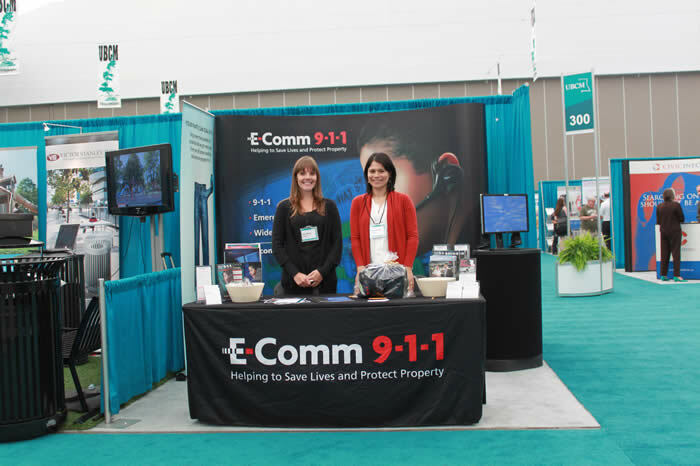 September 23 & 24 E-Comm attended the UBCM tradeshow to provide public safety information to delegates. 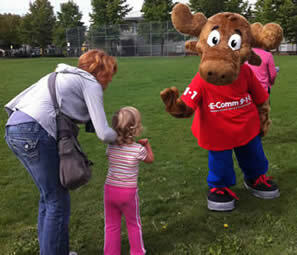 E-Comm celebrated Canada Day and the rich heritage of the Steveston community at the Steveston Salmon Festival July 1. 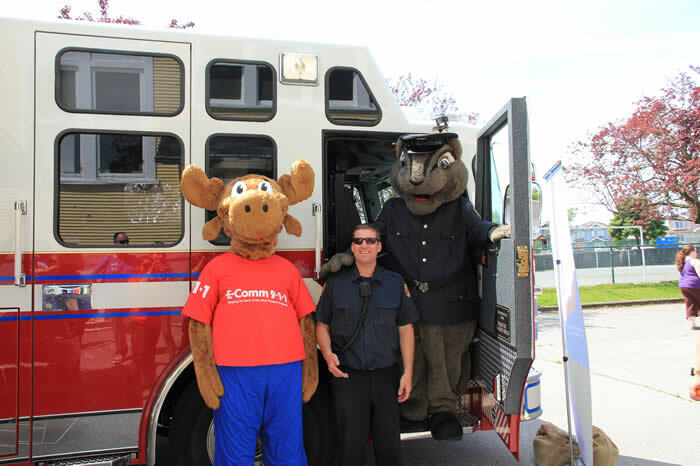 On October 5 E-Comm joined New Westminster Fire & Rescue Services for their annual Open House. 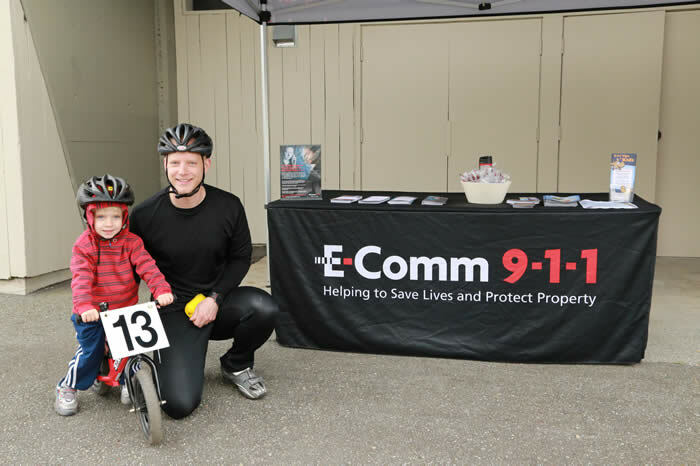 On May 10 E-Comm attended the Amazing Disaster Rally in New Westminster - an event that helps showcase the important role cyclists have in emergency situations. 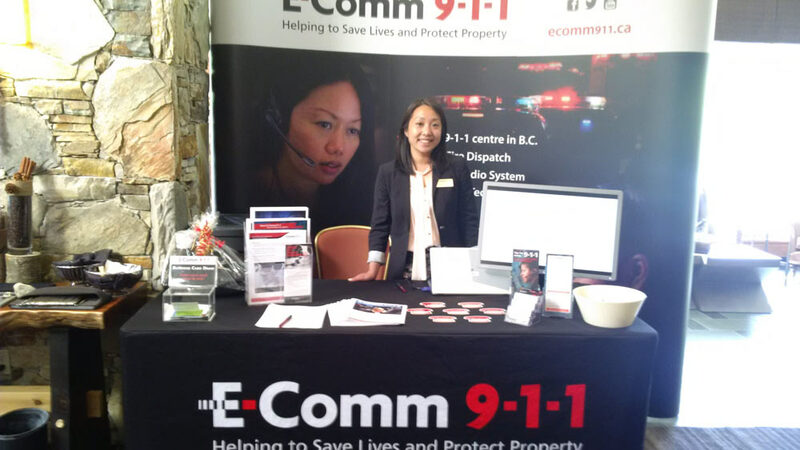 From August 24-27 E-Comm attended the Canadian Association of Chiefs of Police Conference in Victoria. 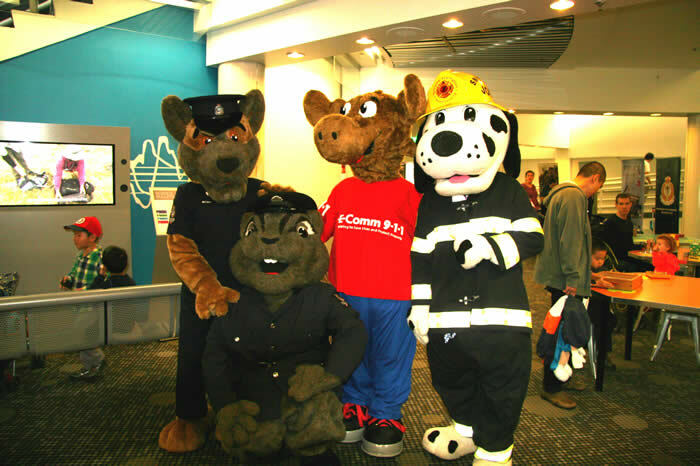 On October 18 and 19 E-Comm attended First Responders Weekend at Science World. 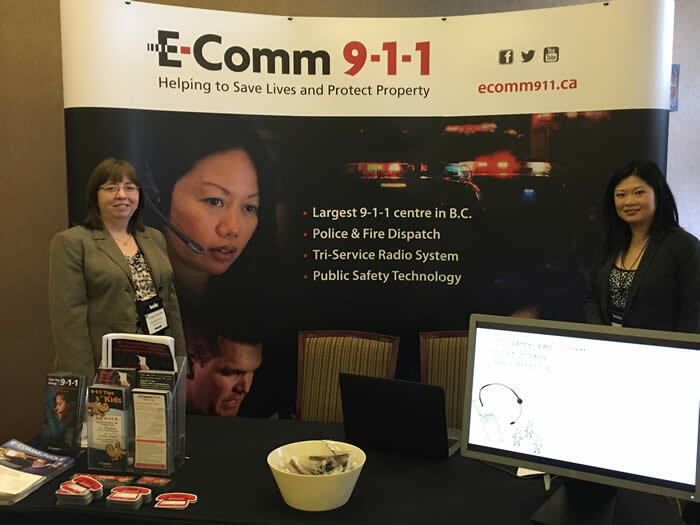 From February 23-26 E-Comm attended the Canadian Association of Chiefs of Police (CACP) Information & Communications Technology Workshop in Vancouver. 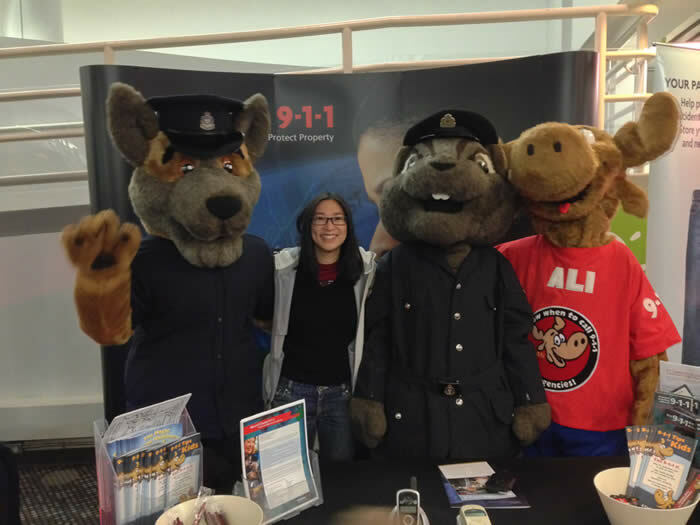 On April 24 from 1pm-3pm ALI joined the Burnaby RCMP at Metropolis at Metrotown for a Community Safety Forum. 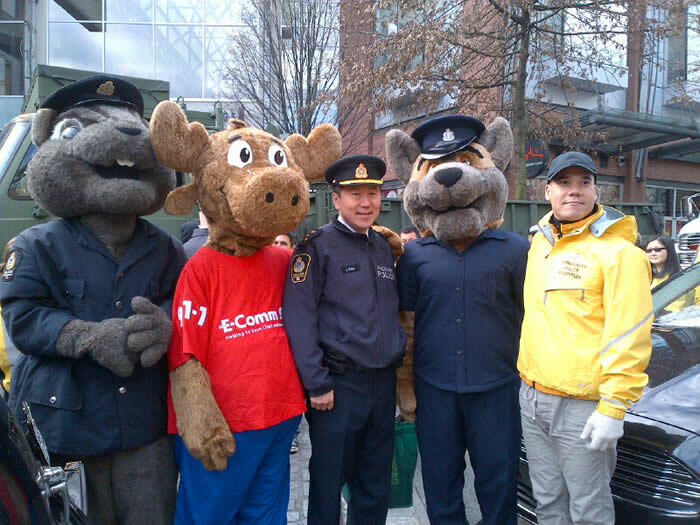 On September 24 E-Comm joined our Vancouver Police partners on the streets of downtown Vancouver to help raise funds for Raise-a-Reader Day. 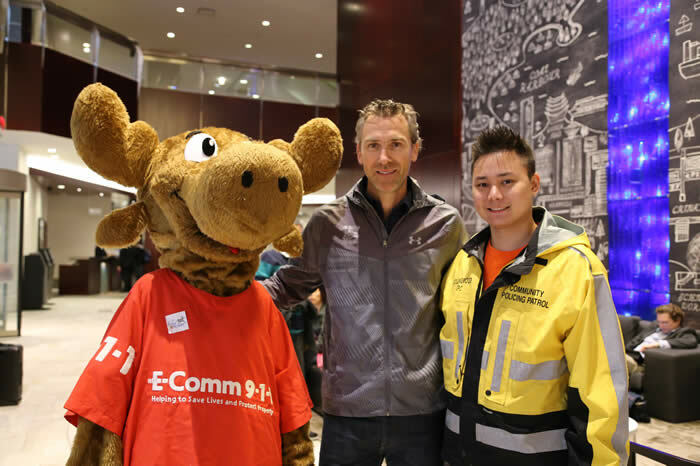 On September 27 E-Comm joined our Burnaby RCMP partners for their 2nd Annual Open House. 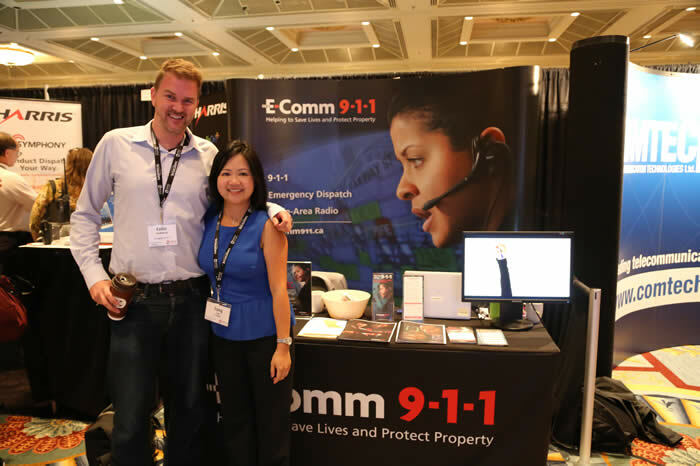 From November 3-6 E-Comm attended the APCO Canada 2014 Conference & Tradeshow in Vancouver. 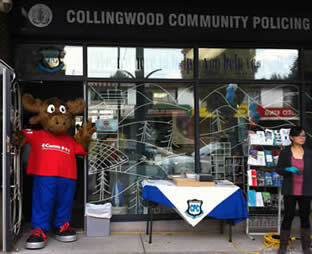 E-Comm celebrated Collingwood's heritage at this year's Collingwood Days Festival on May 31. 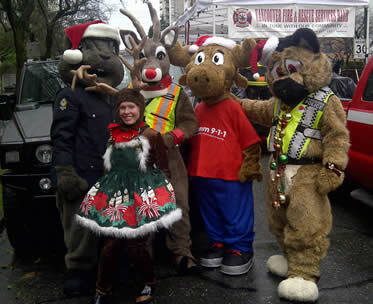 On December 7 E-Comm marched alongside our Vancouver Police partners in Vancouver's annual Santa Claus parade. 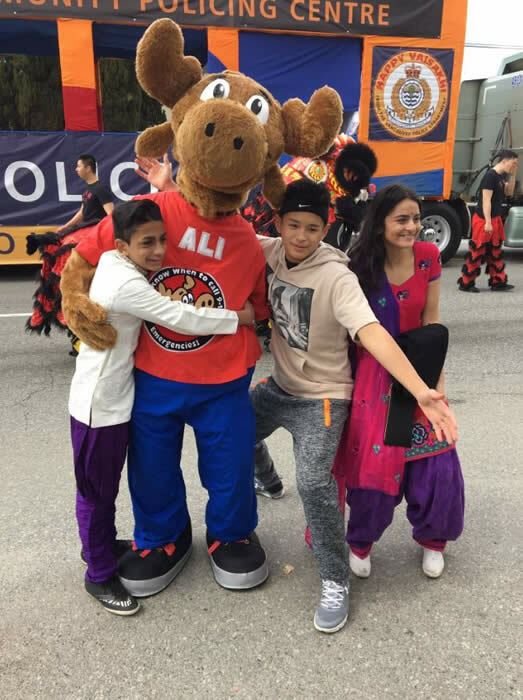 ALI marched alongside our Vancouver Police Department partners in the 2014 Vancouver Vaisakhi Parade on April 12. 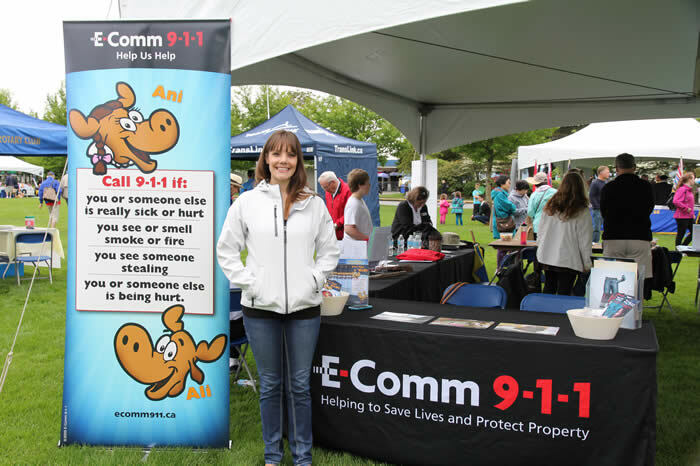 E-Comm participated in West Vancouver's Community Day on June 7. 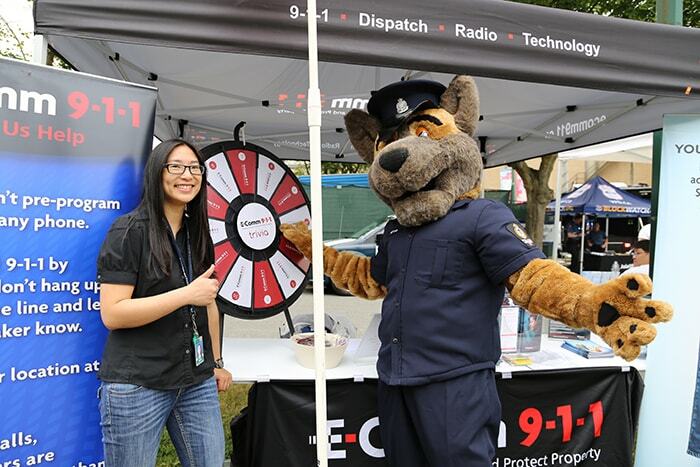 On August 16 E-Comm joined a number of first responder partners and agencies at the opening weekend of the PNE for its First Responders Weekend. 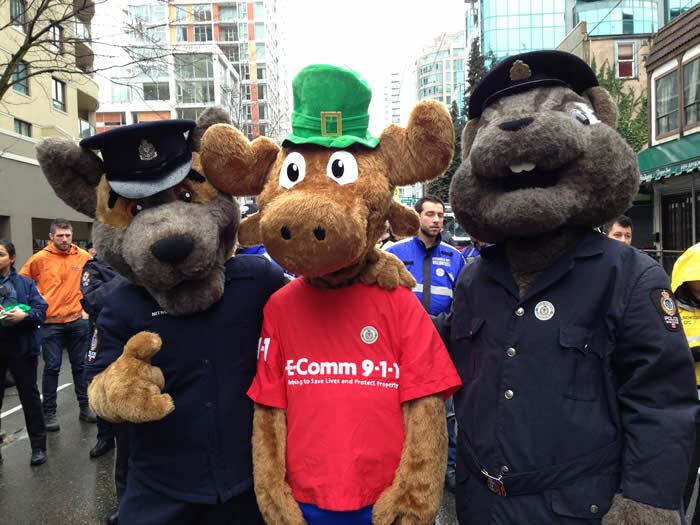 On March 16 ALI joined our Vancouver Police Partners for the 2014 St.Patrick's Day Parade! 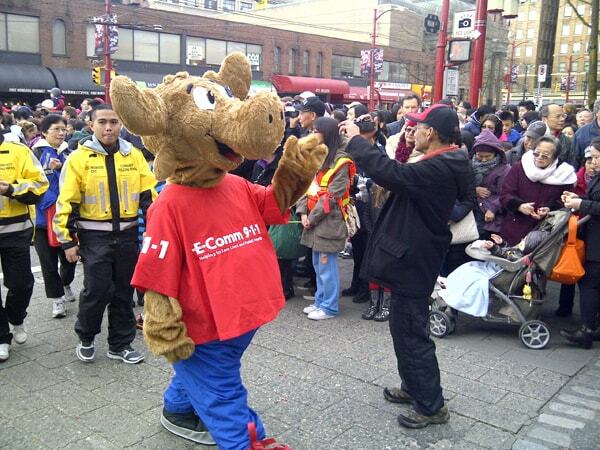 On February 2 E-Comm marched in Vancouver's 2014 Chinese New Year Parade through historic Chinatown. 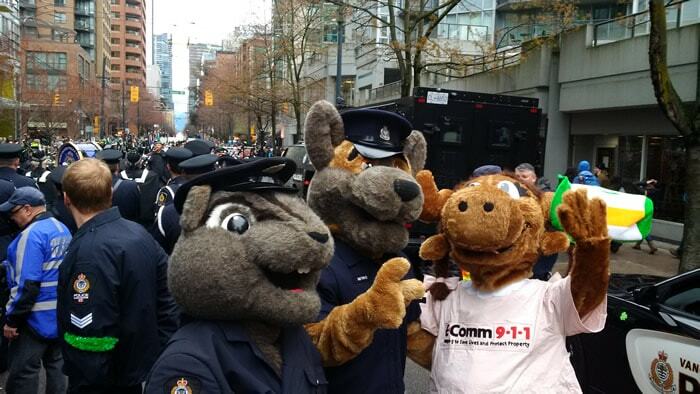 On August 3 E-Comm walked alongside our Vancouver Police partners in downtown Vancouver for the Pride Parade. 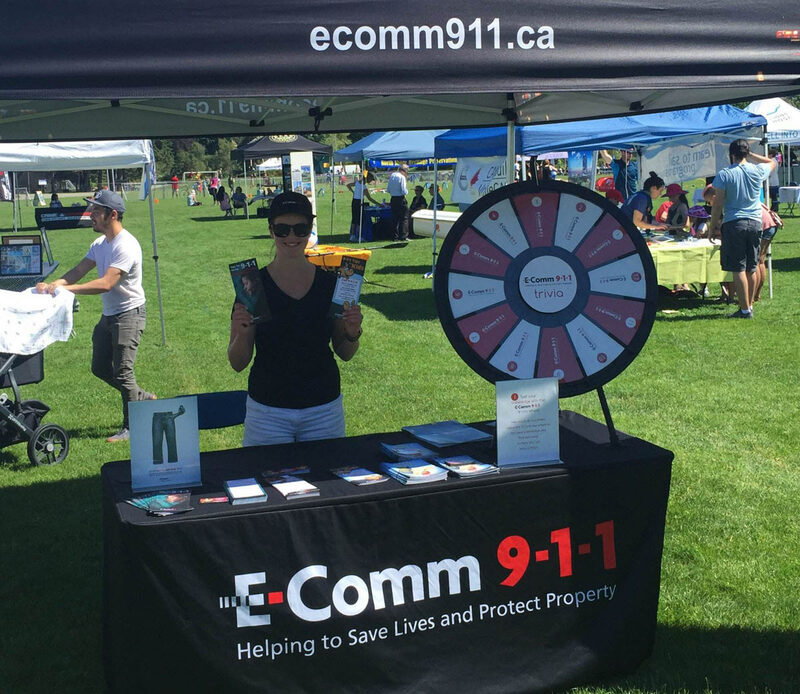 On September 14, E-Comm ambassador ANI attended the 10th Annual Cops, Kids and Commercial Drive event at Grandview Park. 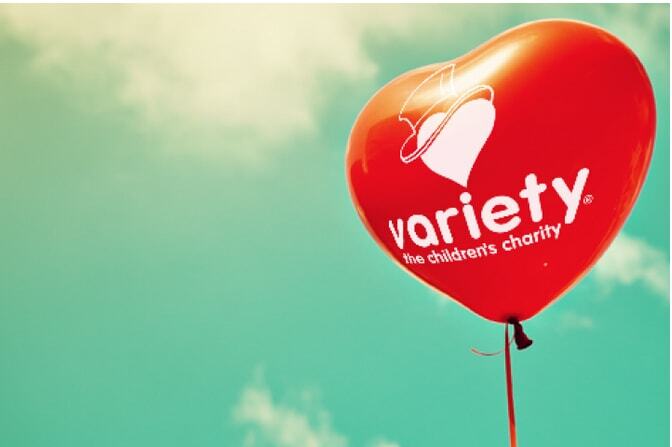 On January 26 several E-Comm staff volunteered for the Variety Show of Hearts Telethon that raised $6.6 million for the Children's Charity. 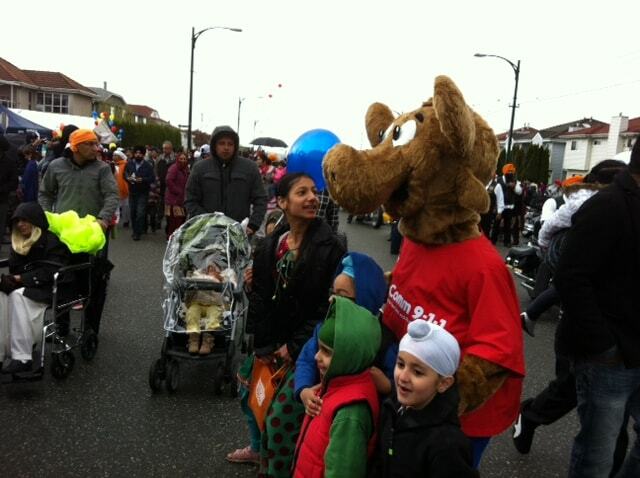 ALI marched with the Vancouver Police Department at the Vancouver Vaisakhi Parade & Celebration on April 13, 2013. 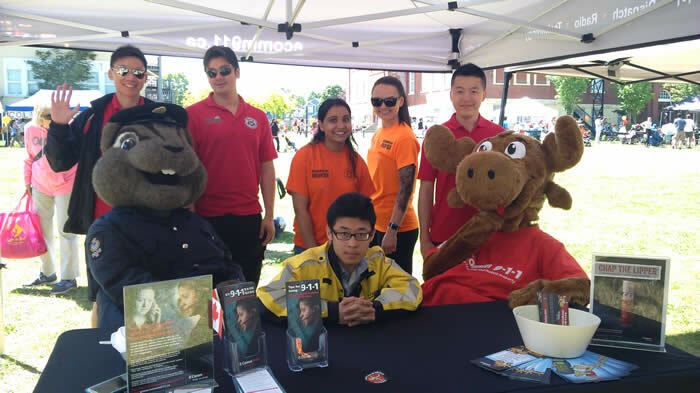 On September 14, ALI attended the Burnaby RCMP Open House, a free and fun event that included exhibits and demonstrations. 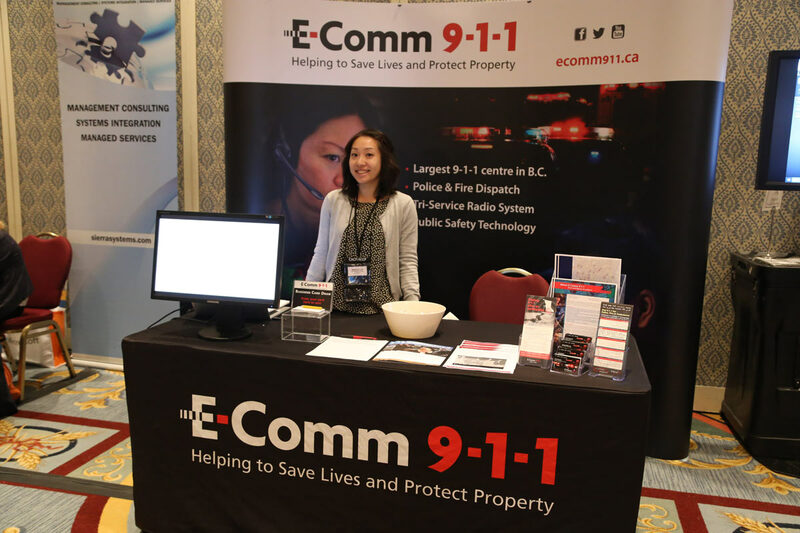 On November 25 & 26 E-Comm attended the Canadian Interoperability Technology Interest Group (CITIG) workshop - a highly interactive event addressing key voice and data interoperability issues facing today's public safety sector. 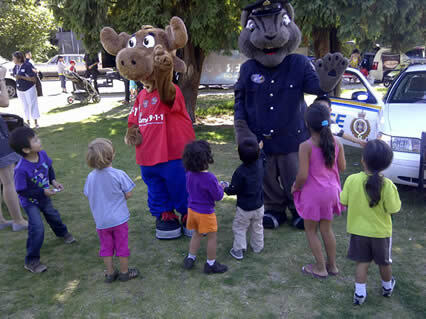 E-Comm attended the eighth annual Cops & Kids event on September 15 at Grandview Park. 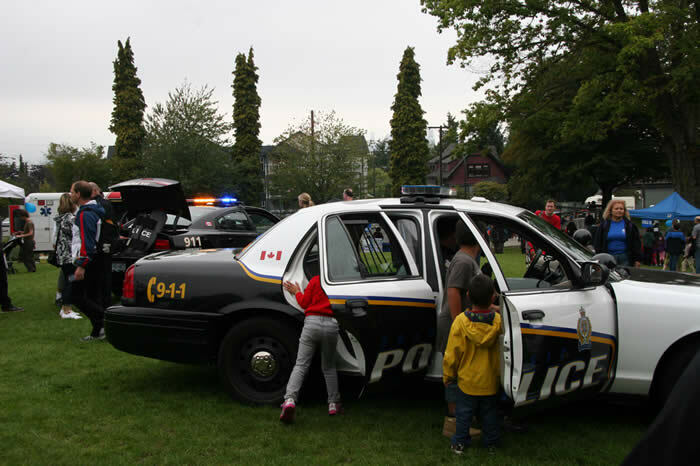 The back-to-school safety event also included VPD patrol officers with their emergency vehicles, the motorcycle squad and more! 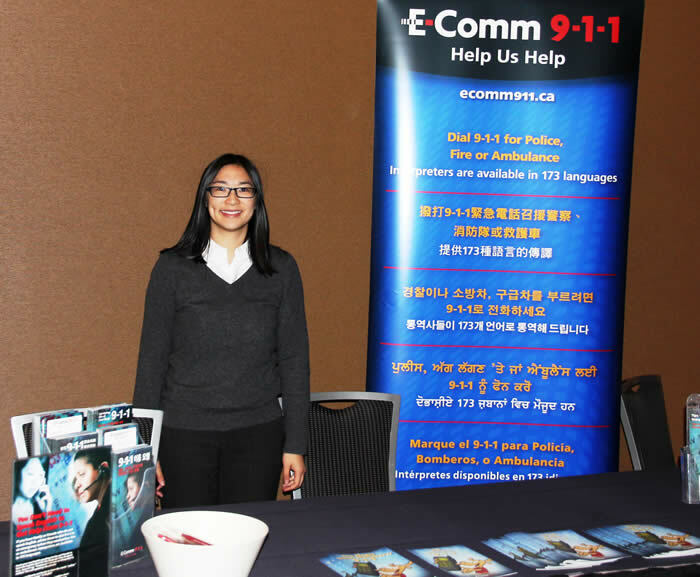 On November 4 E-Comm attended the annual English Language Services for Adults (ELSA) Net Conference in support of basic and intermediate level English training for adult newcomers to Canada. 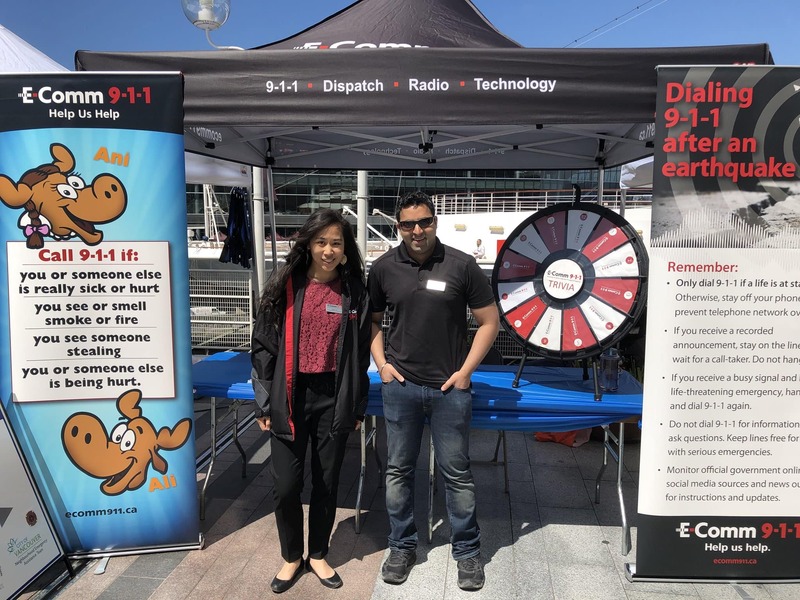 On October 19 & 20 E-Comm attended First Responders Weekend at Science World to help showcase who first responders are, what they do, the technology they use, and the role that science plays in their work. 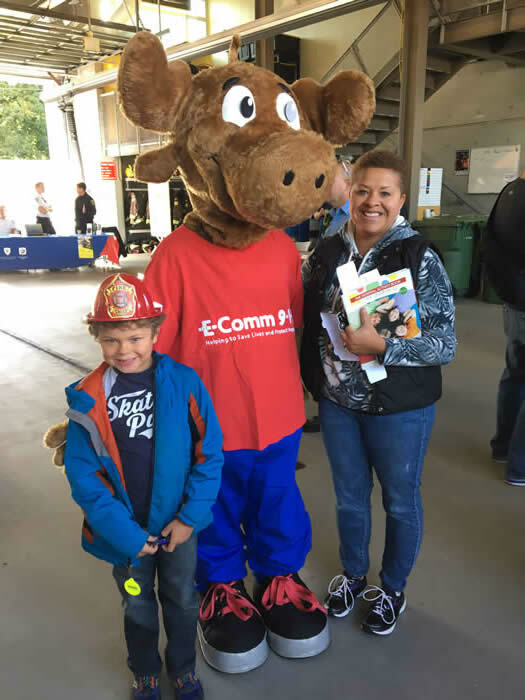 On October 5 ALI attended the New Westminster Fire & Rescue Services Open House to learn about emergency services, community safety agencies and fire safety. 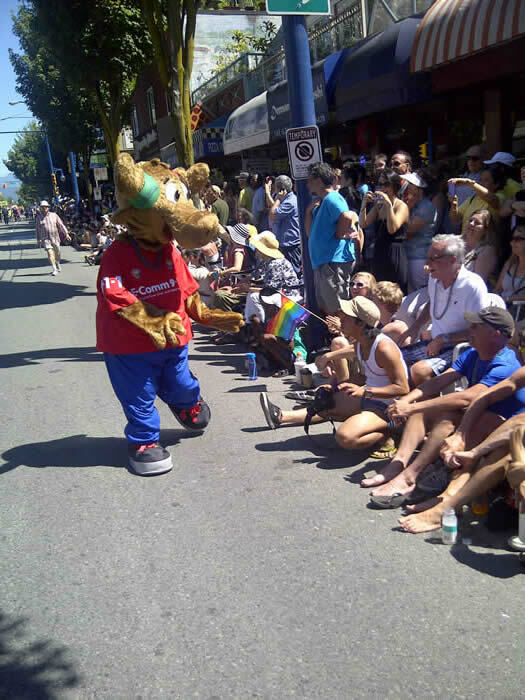 ALI showed his support by marching alongside our policing partners and volunteers at the Vancouver Pride Parade on August 4. 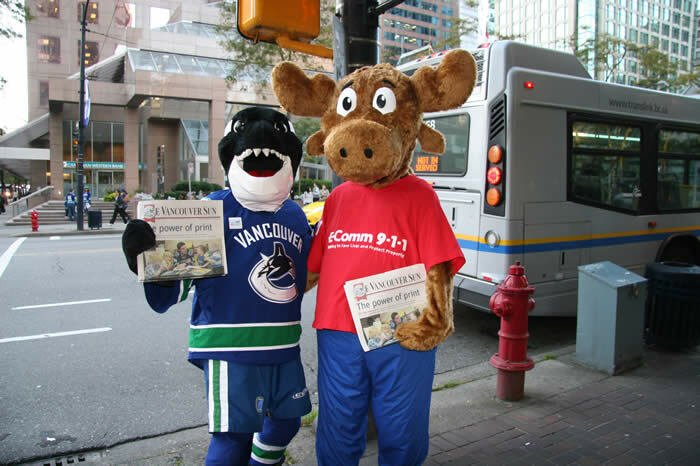 ALI joined other famous mascots on the streets of downtown Vancouver September 25 to help raise funds for Raise-a-Reader Day. 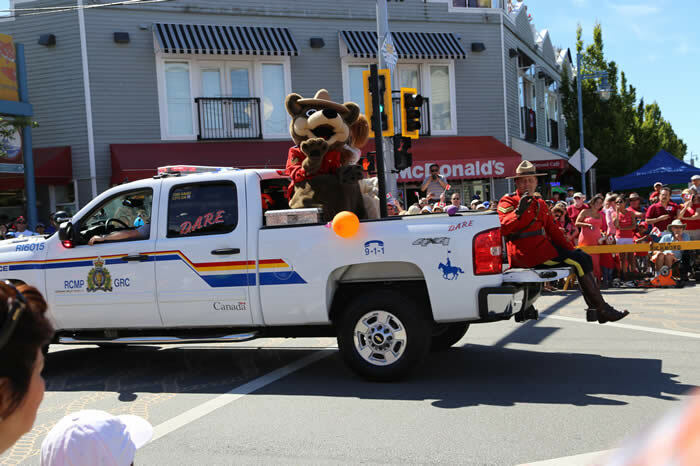 On August 27, ALI attended one of Canada's most beloved traditions - the RCMP Musical Ride in Burnaby. 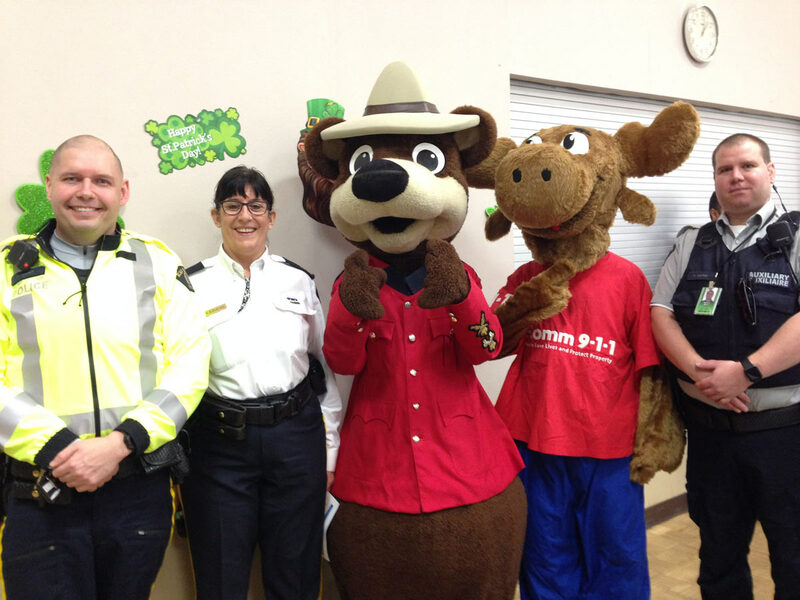 ALI marched in the St. Patrick's Day parade with the Vancouver Police department on March 17, 2013. 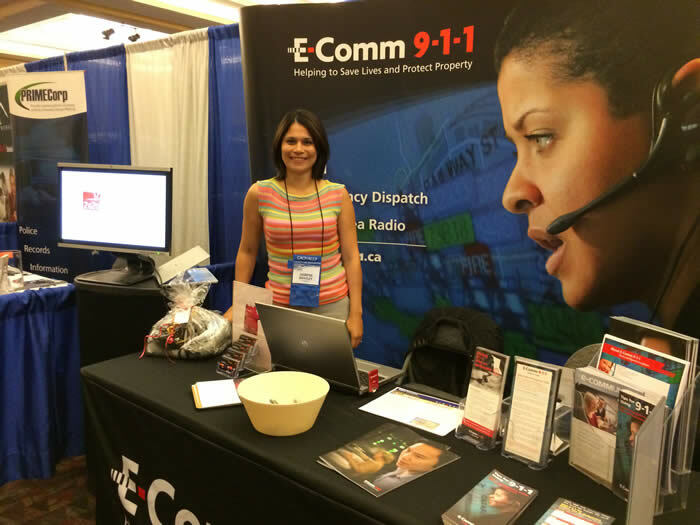 E-Comm hosted an information booth at this year's UBCM conference and exhibition on September 18 & 19. 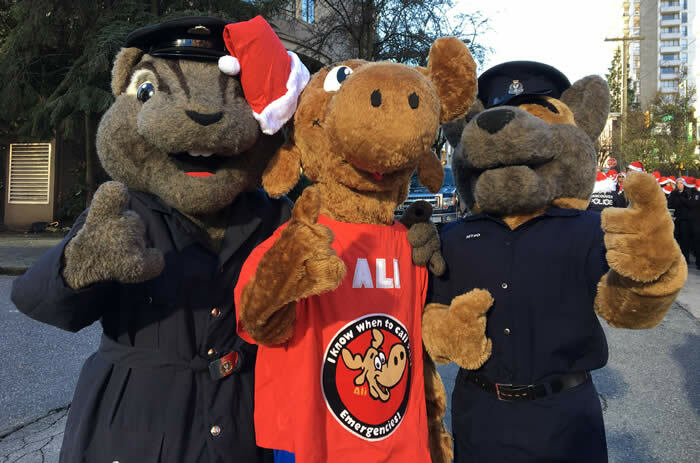 On December 1 ALI joined the Vancouver Police Department for the 10th Annual Rogers Santa Claus Parade. 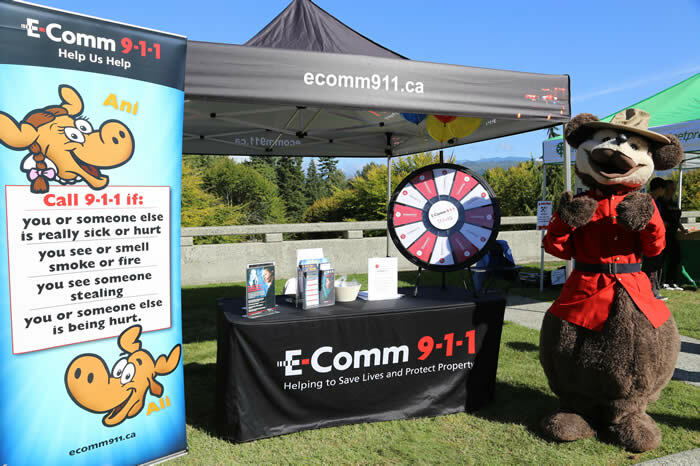 E-Comm celebrated Community Day in West Vancouver on June 1. 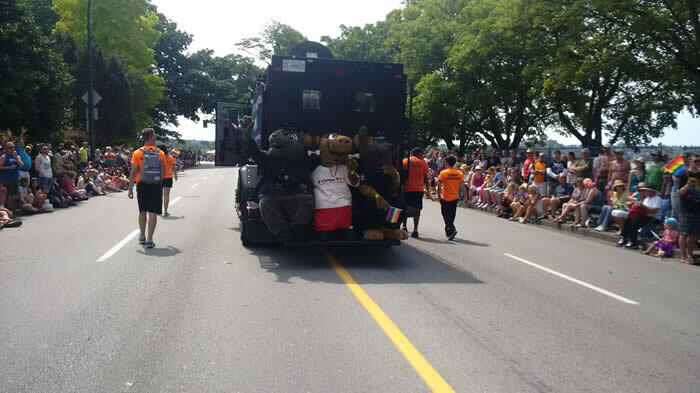 The fun-filled day began with a parade, followed by activities and festivities for the whole family. 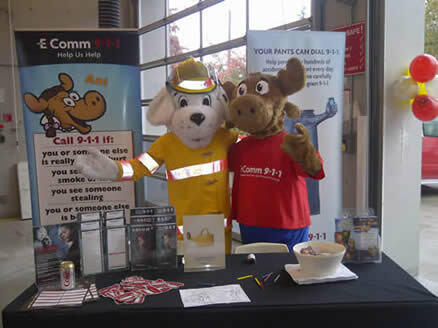 E-Comm hosted a public education booth at the New Westminster Fire & Rescue Services' 6th Annual Open House on October 13, 2012 at the Glenbrook Fire Hall. 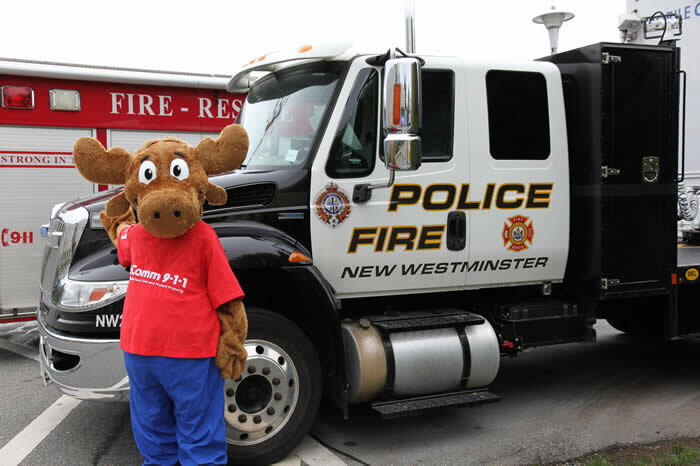 The event included live dispatch and auto extrication demos, equipment displays, the New West Firefighters' Charitable BBQ by donation and mascots Sparky the Fire Dog and ALI the 9-1-1 ambassador. 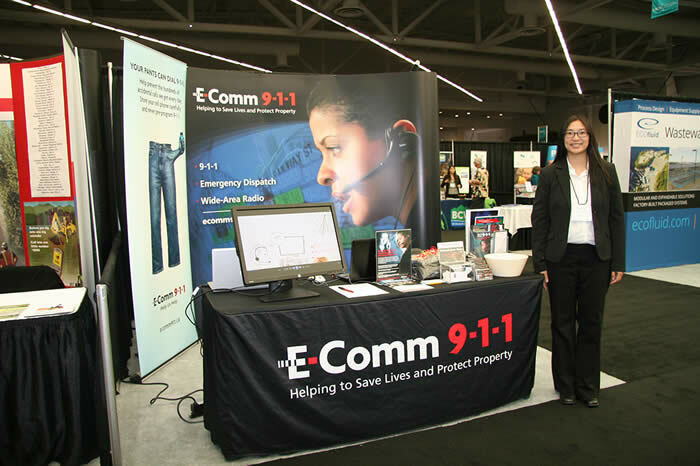 E-Comm hosted an exhibit at the Canadian Risk and Hazards Network (CRHNet) annual symposium's tradeshow in Vancouver October 24-26, 2012, where we launched our new "Dialing 9-1-1 after an earthquake" info cards. 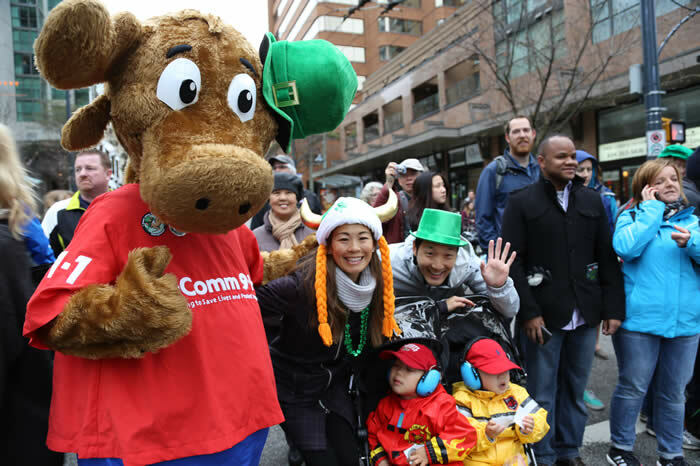 ALI, our favourite 9-1-1 moose mascot, marched in this year's Celtic Fest Vancouver's Annual St. Patrick's Day Parade on Sunday, March 18. 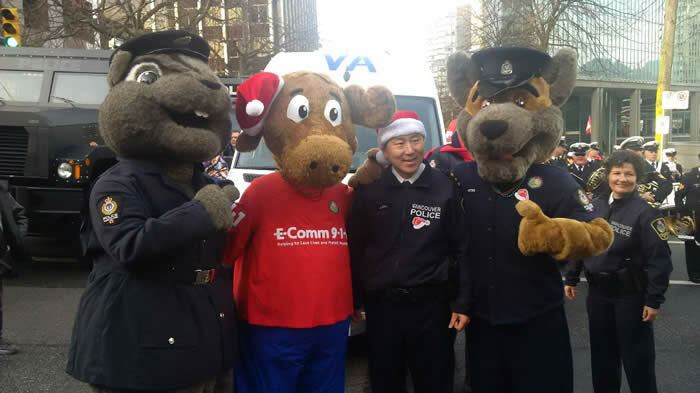 Along with his partners from some of Vancouver's Community Policing Centres and Vancouver Police Department, he gave our stickers, magnets and a lot of high-fives! A great event that we hope to be at again in upcoming years. 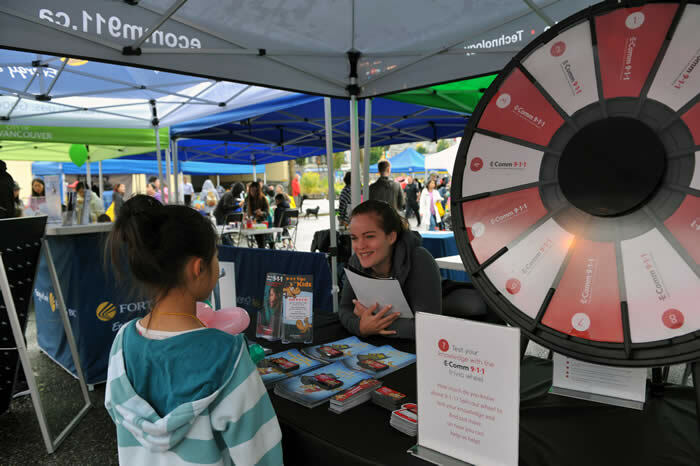 Despite all the rain, Golden Spike Days provided an awesome venue for vendors at Rocky Point Park on June 30 in Port Moody this year. 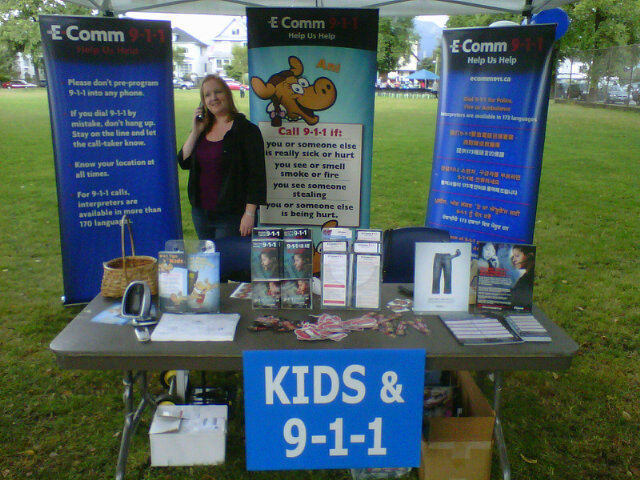 We had a great time talking to passerbys about 9-1-1 tips for both adults and kids! 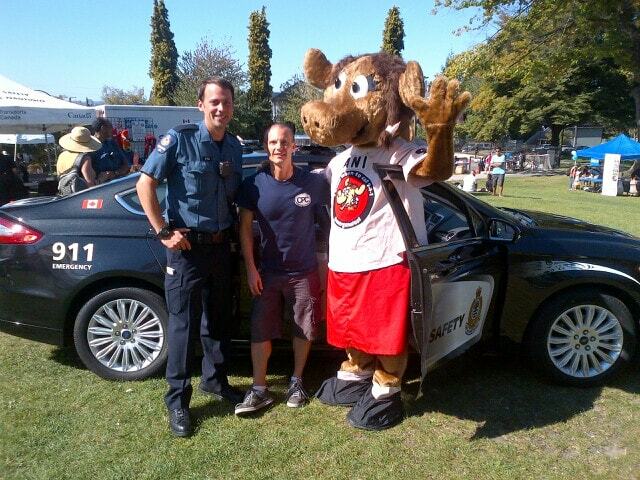 It was another great event at this year's Cops, Kids & Commercial Drive event at Grandview Park in Vancouver. 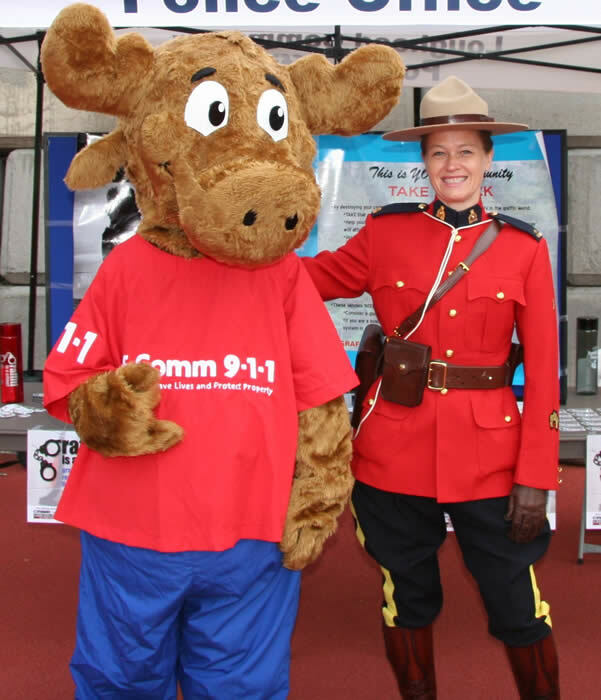 This annual back-to-school event, held Sunday, September 16 this year, brought kids and families in droves to learn about 911, local policing and of course to meet ALI, our favourite moose (pictured above alongside VPD Constable Chip). ALI stopped by the Community Policing Day open house at the Collingwood CPC on Sept. 29 for a BBQ and bike safety roadeo for kids. 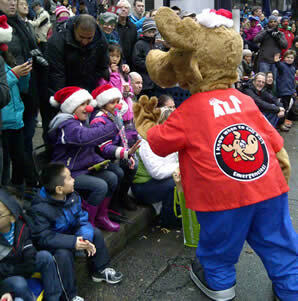 Our new mascot, ALI, debuted at this year's Chinese New Year parade in Vancouver's Chinatown on Sunday, January 29 this year! 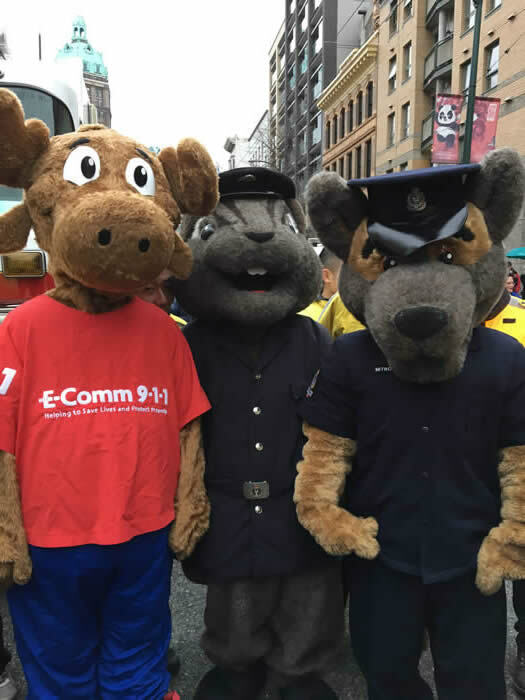 Walking alongside the Vancouver Police Department and our local community policing centres, kids and families got the chance to pick up some of our 9-1-1 education material and meet Luke, ALI and Cst Chip (pictured below). 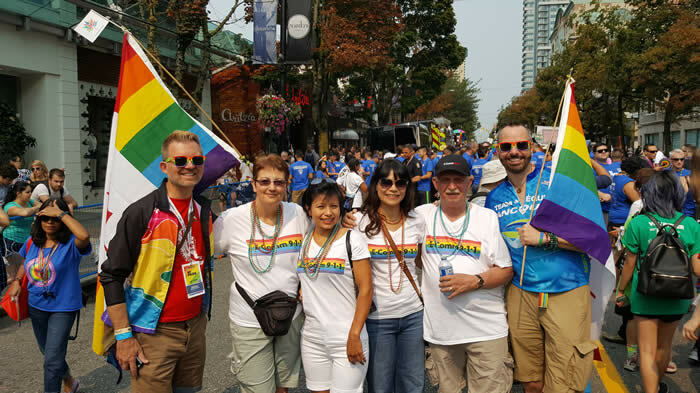 ALI, our beloved 9-1-1 ambassador, walked alongside our policing partners and volunteers at the annual Pride Parade through the streets of Downtown Vancouver on Sunday, August 5. 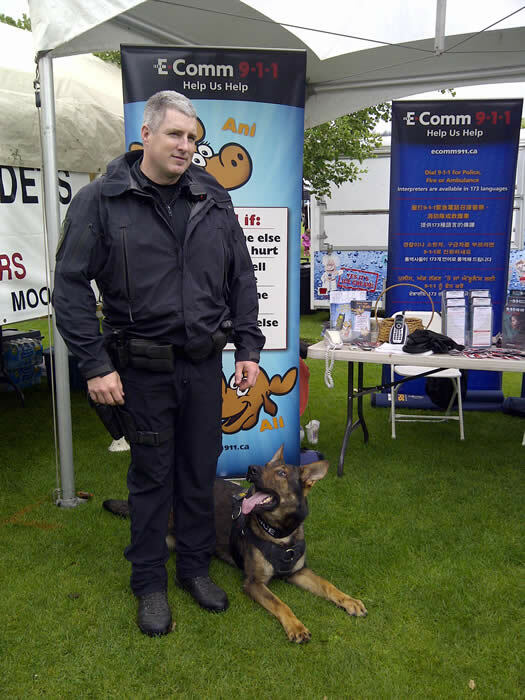 His pride filled stickers were a hit in the crowds of over 600,000 spectators. What an event! 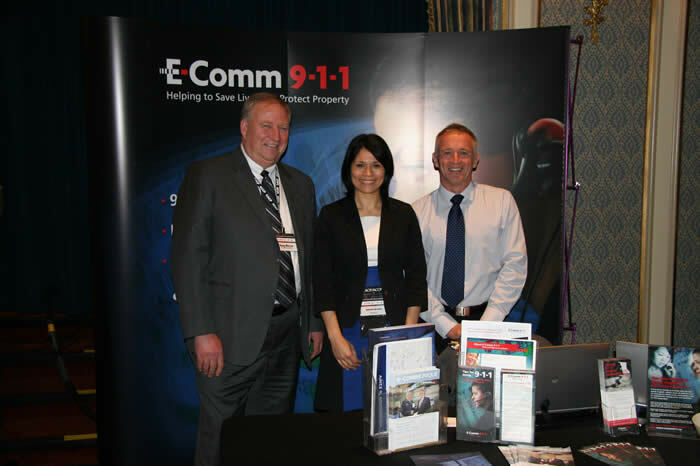 The British Columbia Association of Chiefs of Police, the Ministry of Public Safety and Solicitor General, and the Justice Institute of British Columbia, Police Academy hosted the Police Leadership 2011 Conference in Vancouver, British Columbia. This is Canada's largest police leadership conference. E-Comm GIS Coordinator Robert Darts spoke to delegates about Emergency Events Map Viewer our GIS/CAD data integration application. E2MV is designed to provide a common operating picture for emergency services. Held September 28 & 29 at the Vancouver Trade and Convention Centre, we were thrilled to host a booth and meeting delegates from all over the conference at the UBCM Exhibition. The Cops for Cancer riders stopped at E-Comm once again this year to receive a cheque for $3,878 raised via staff donations. We are so proud of our riders who braved the cold and rain!